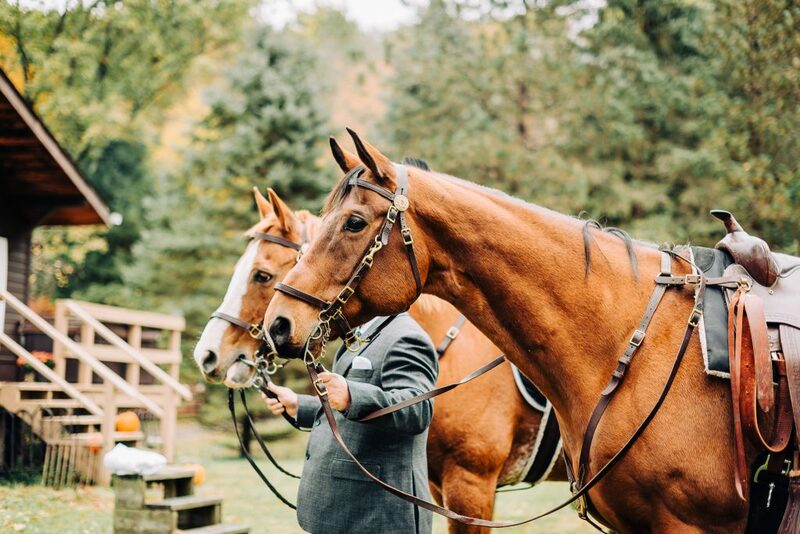 Some months back, we were driving back home from photographing a wedding (check out Heather and Yancey’s wedding here) and Julio was telling me about how impressed he was with Nikki, a woman State Park trooper he had met that day, and how the best man (a.k.a Scott) had these beautiful horses on his property. 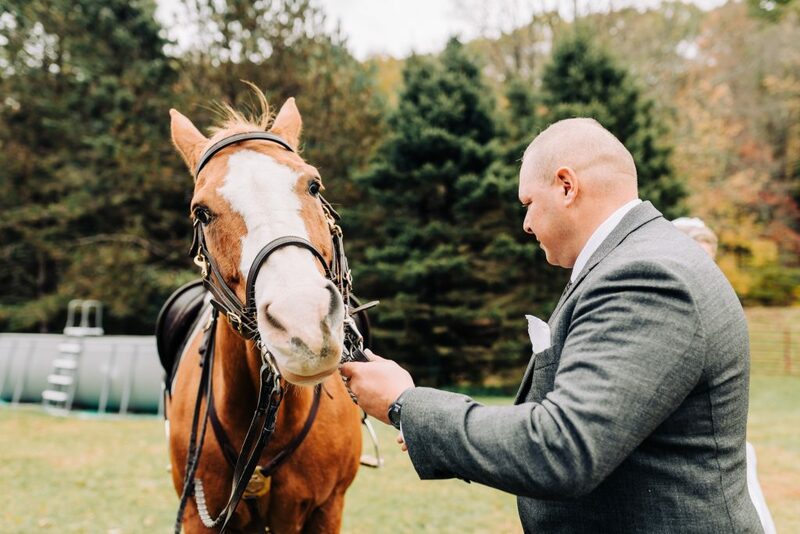 “Wait, horses? 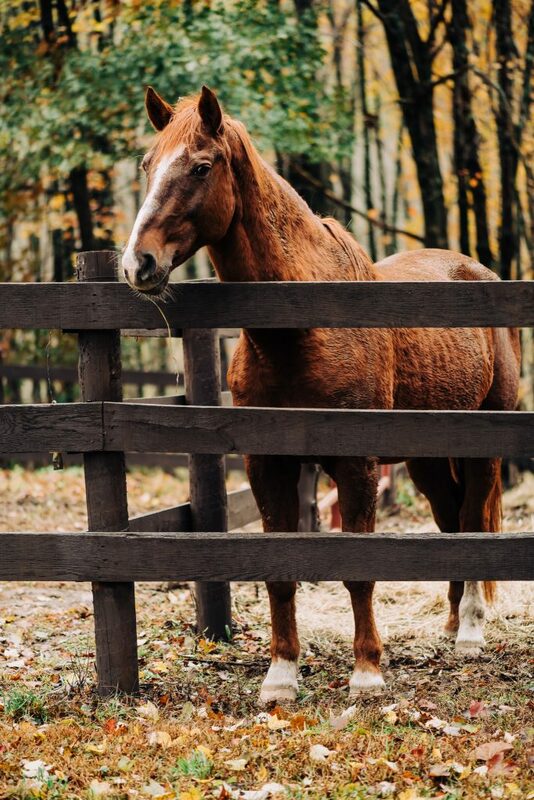 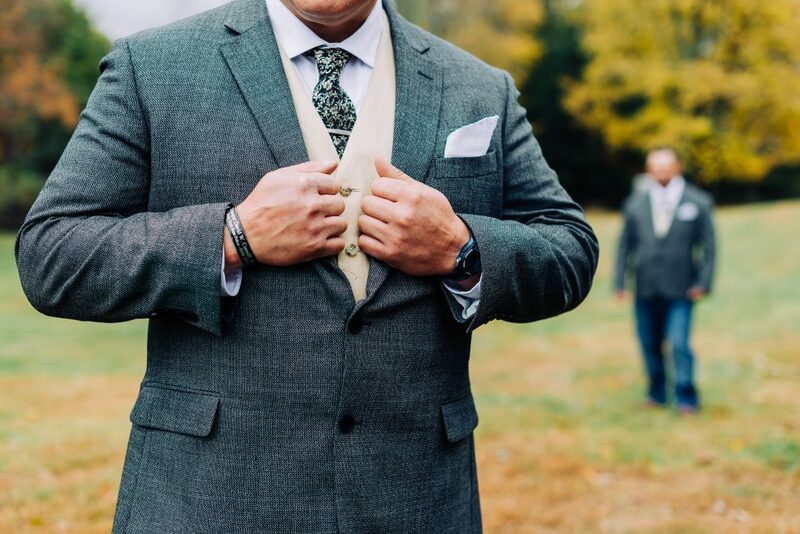 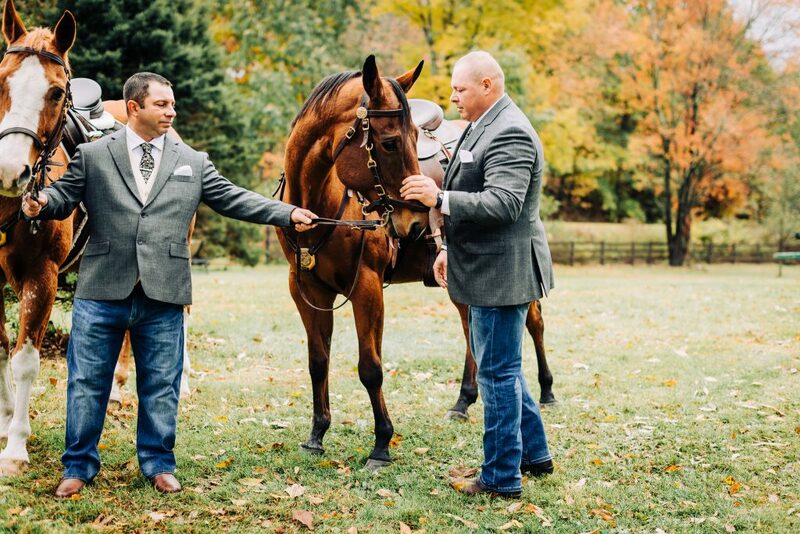 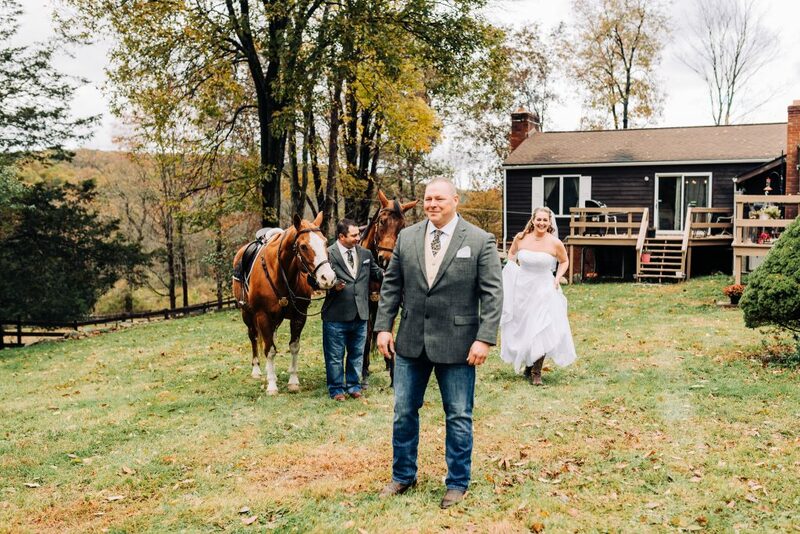 Are you telling me there were horses where the groom got ready?” – Was my reaction. 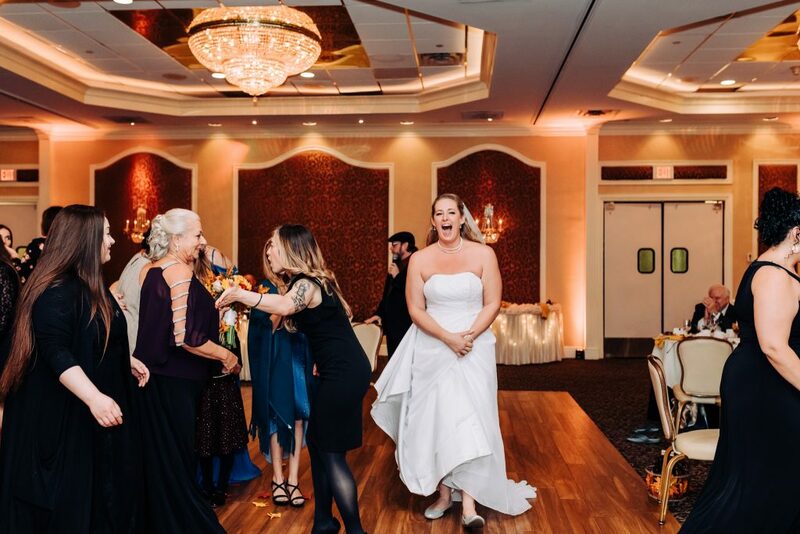 I was immediately sad about the opportunity I had just missed. 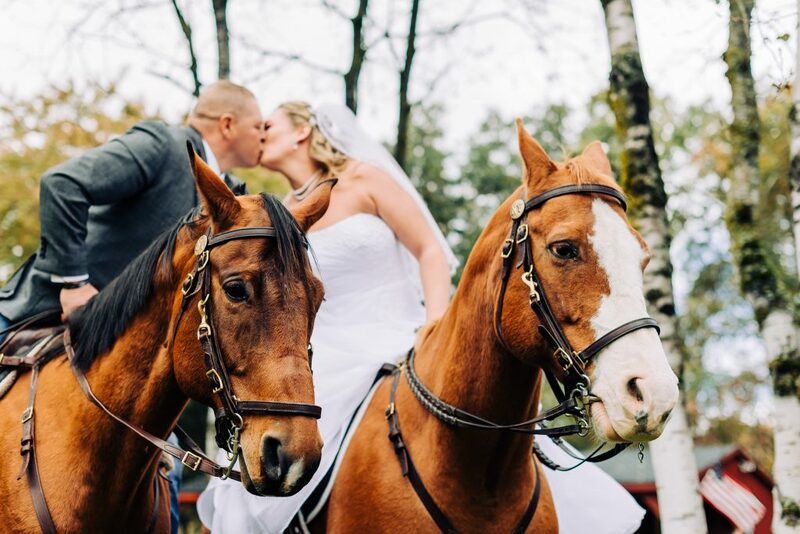 No one told me about the horses, and due to the schedule of that day, Julio had gone to photograph the guys and I stayed with the bride. 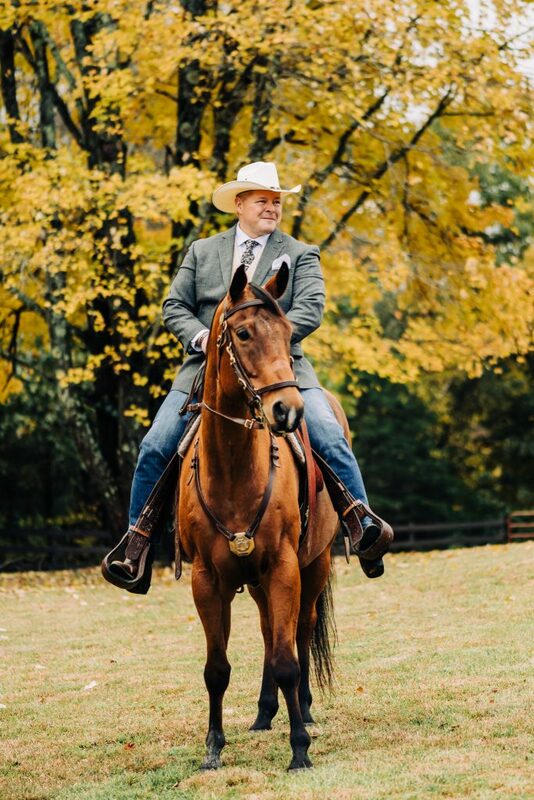 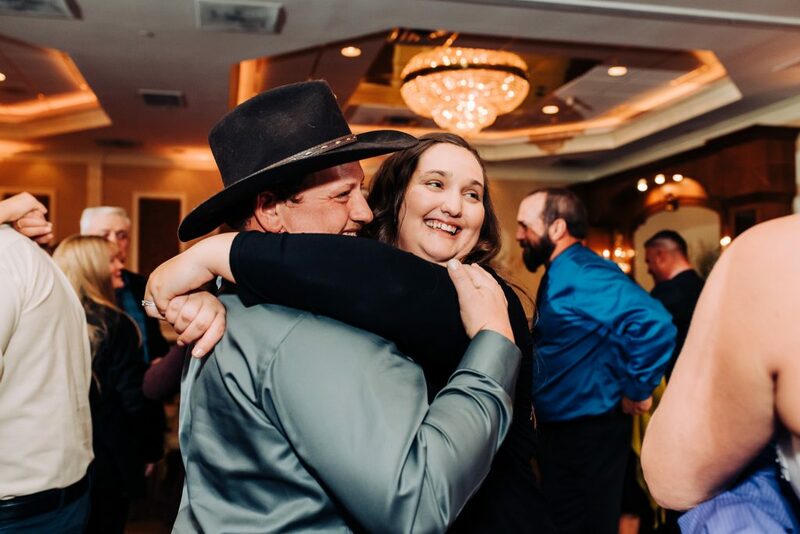 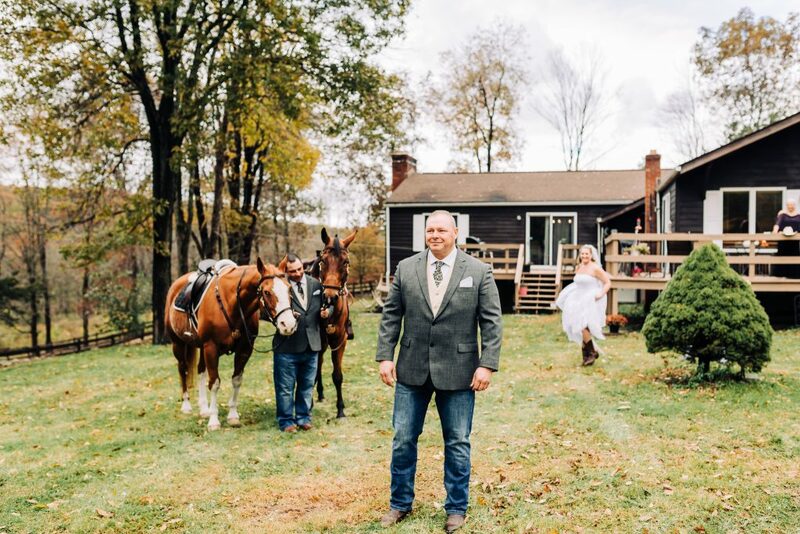 You can’t imagine my excitement when just a couple of months later Nikki and Scott called us to tell us they were getting married, and yes, there were going to be horses. 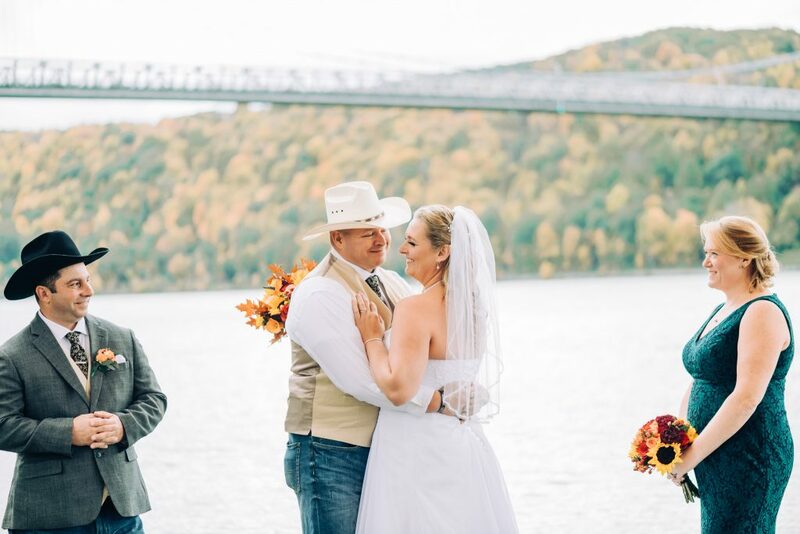 The day of Nikki and Scott’s wedding was a beautiful Poughkeepsie day. 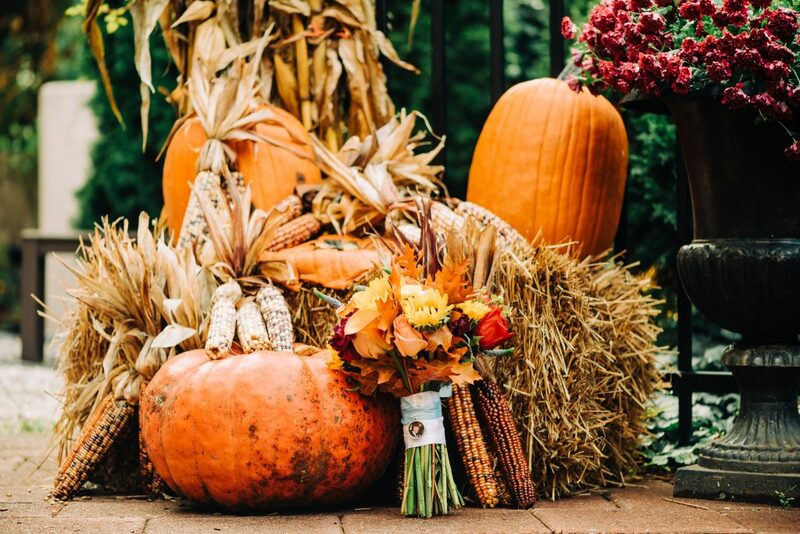 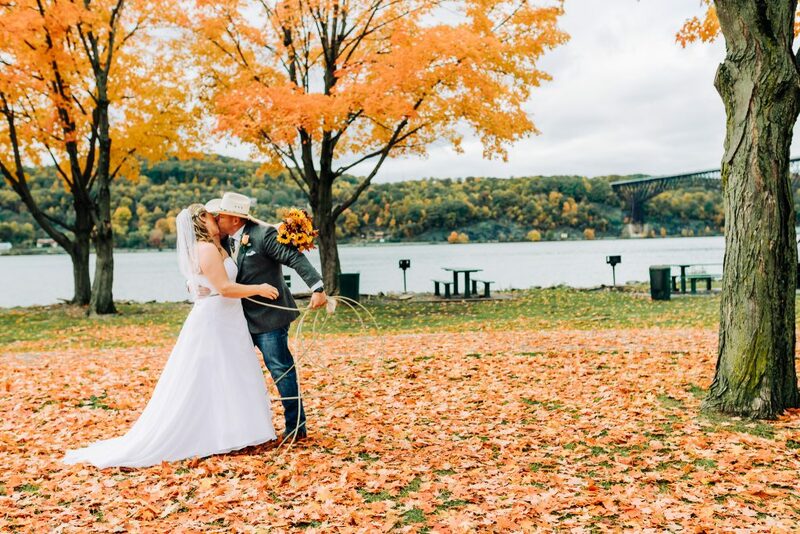 If you have ever been to upstate New York you probably know that weather is totally unpredictable, and a late October day can go anywhere from 70-degree weather to a snowstorm. 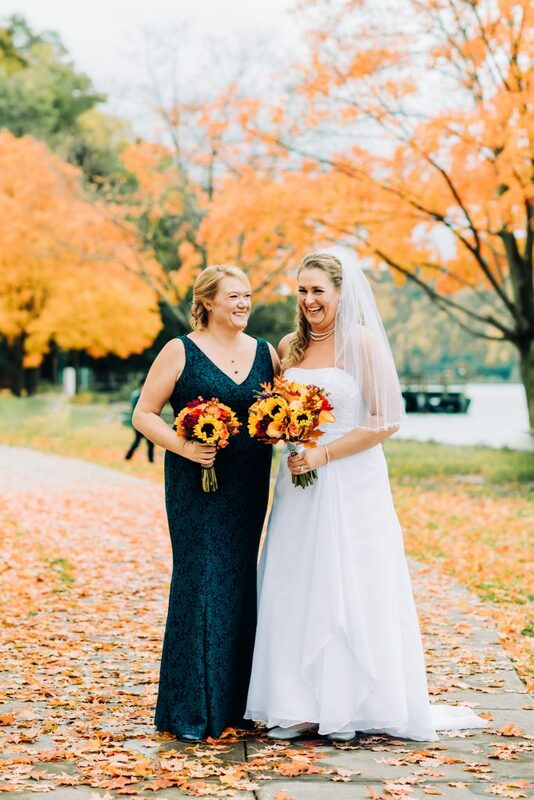 But that day had a perfect light autumn breeze. 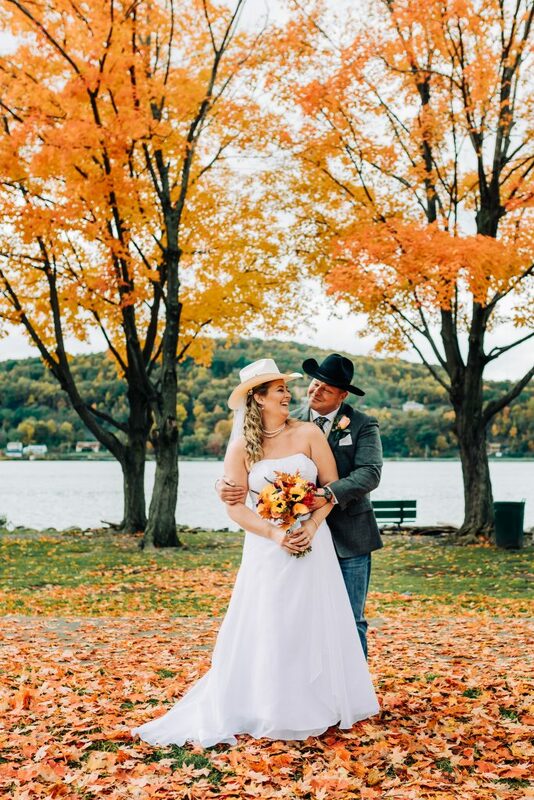 To top it off, it was the peak of fall. 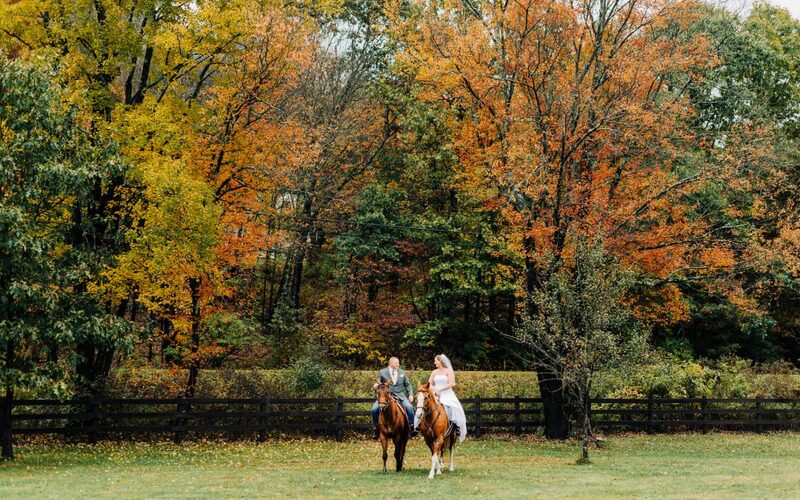 Our drive through the Taconic State Park in the Catskills that morning felt like a gift and the best way to end our 2018 wedding season. 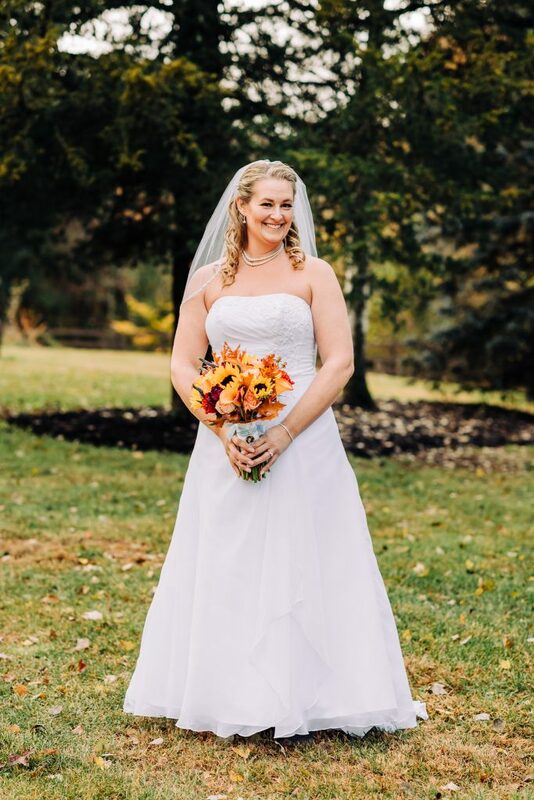 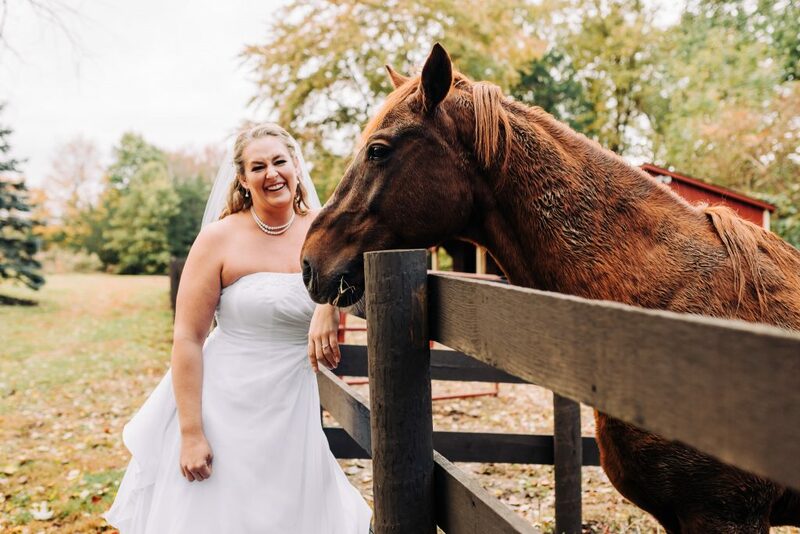 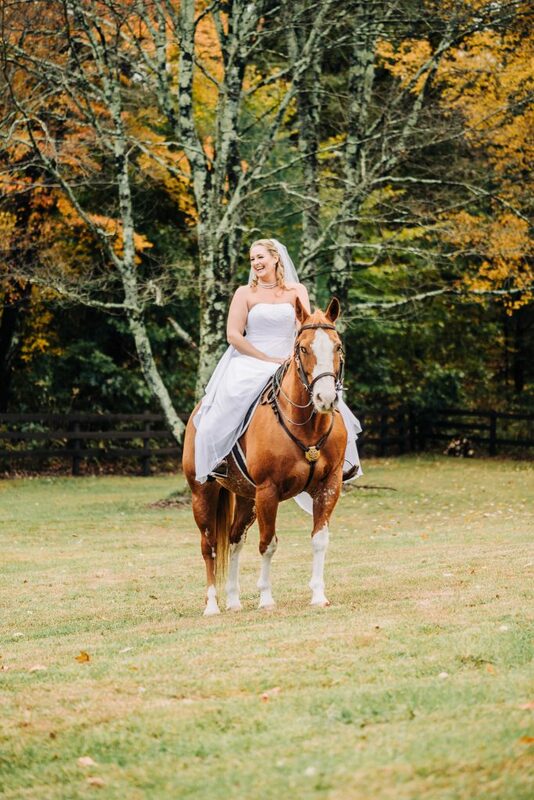 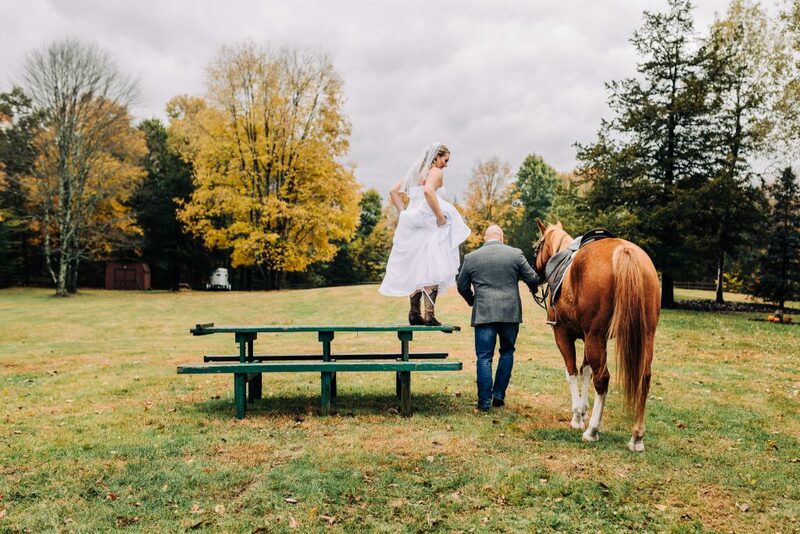 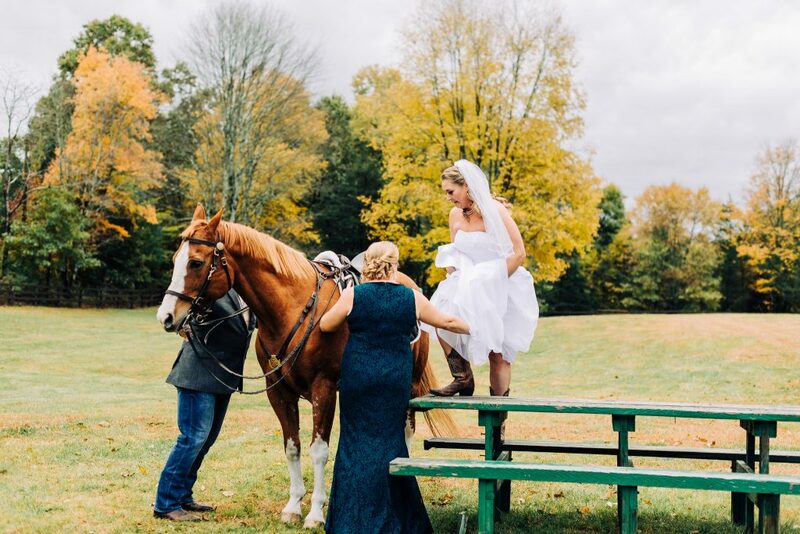 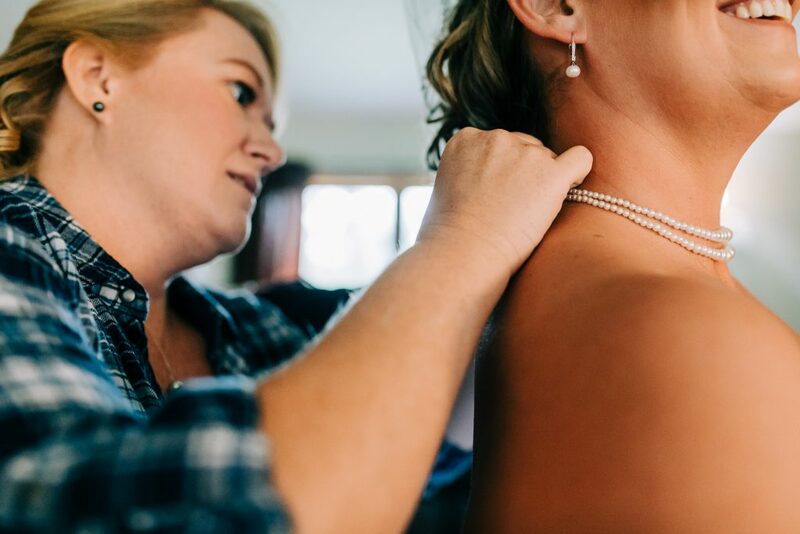 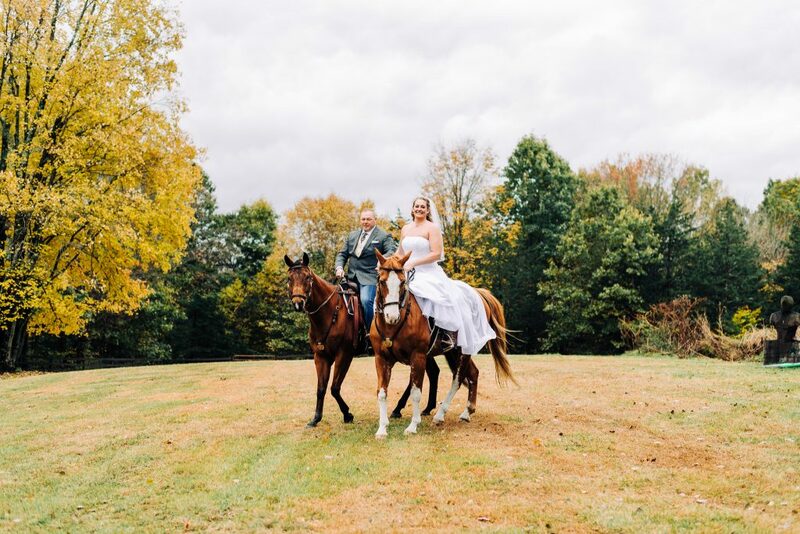 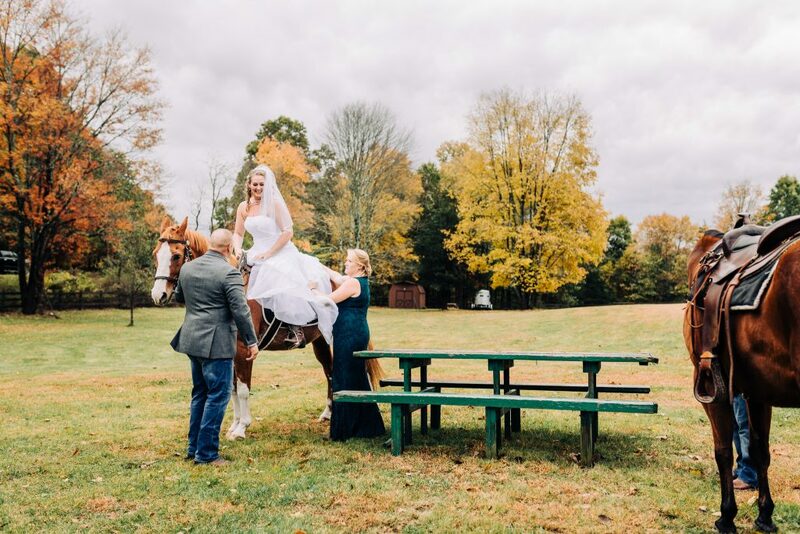 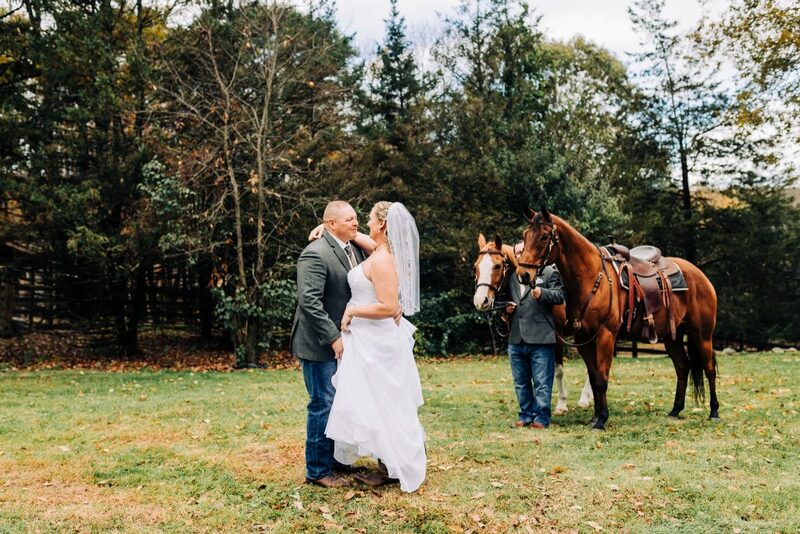 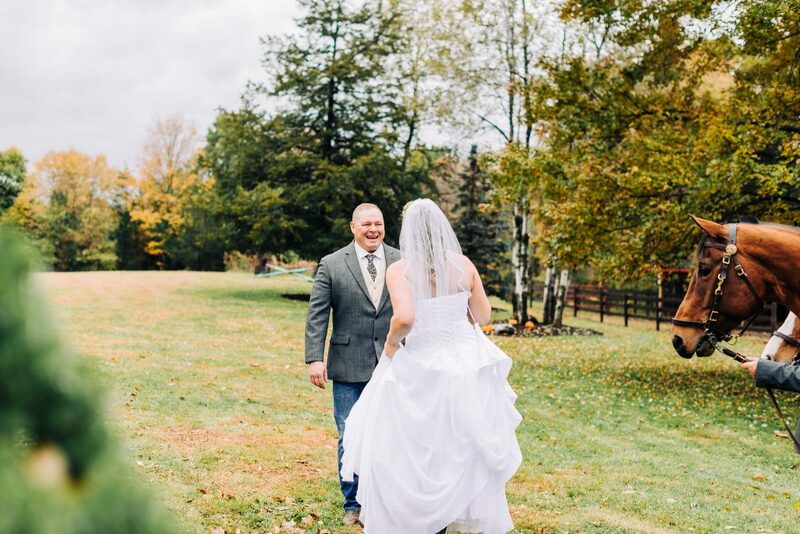 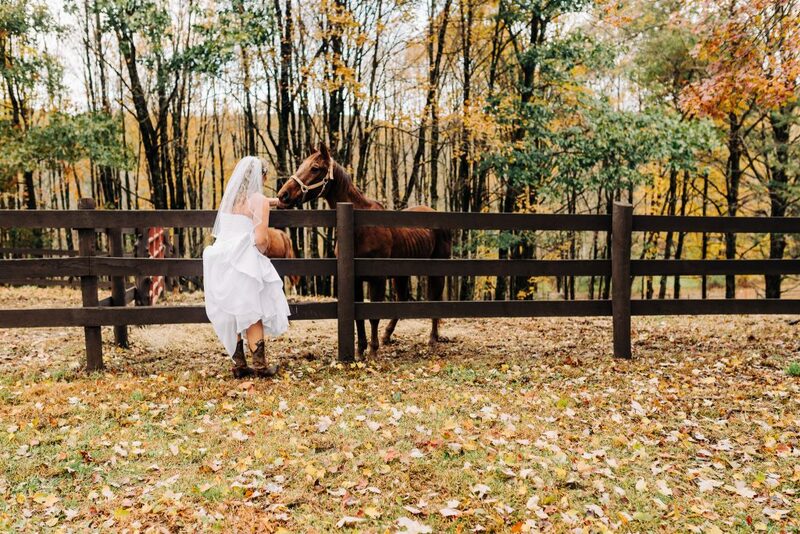 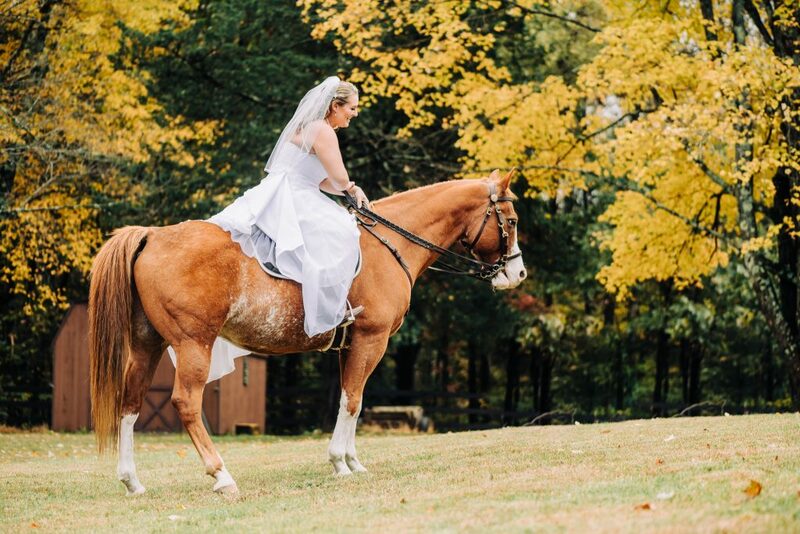 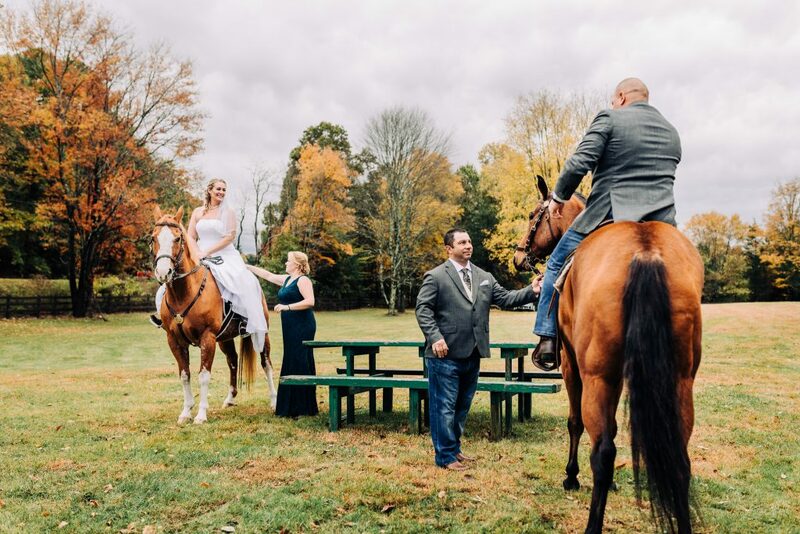 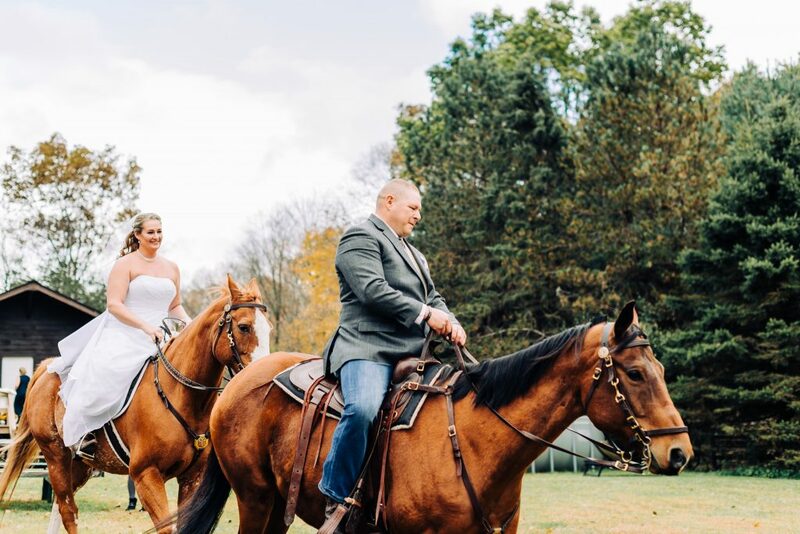 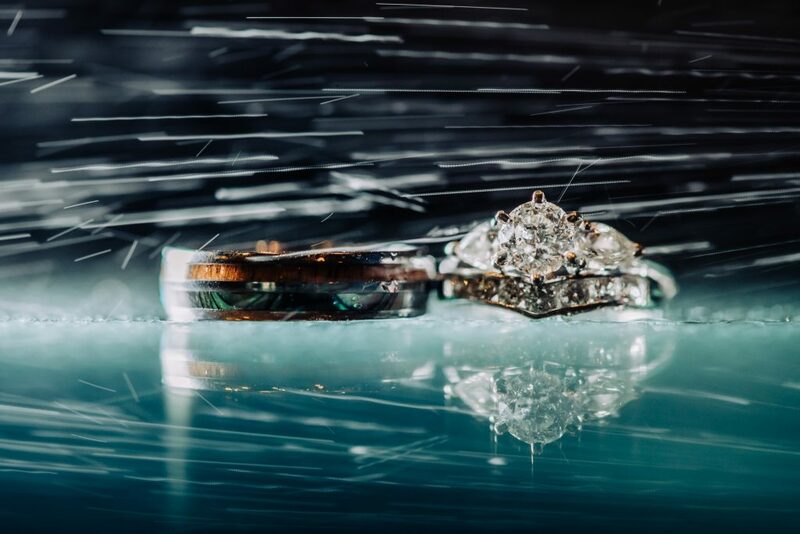 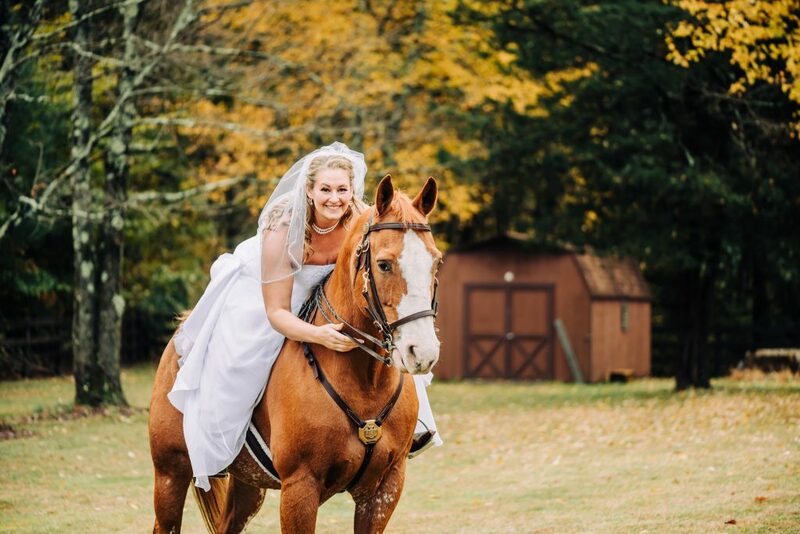 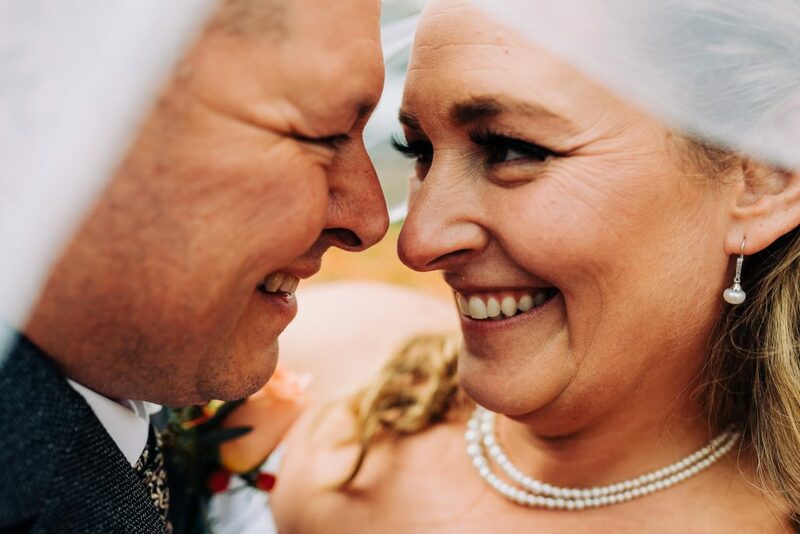 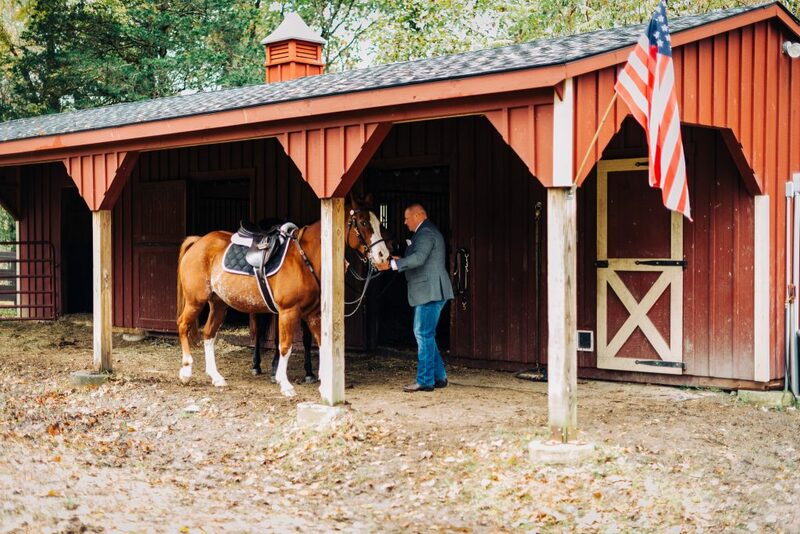 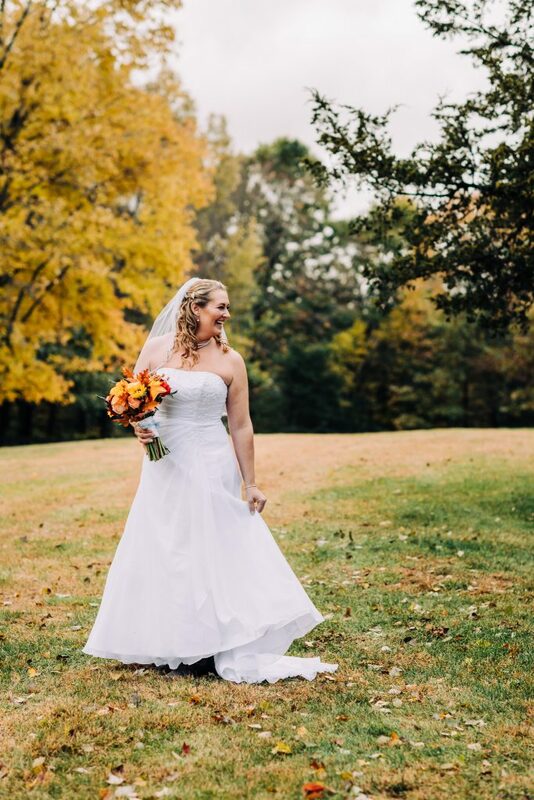 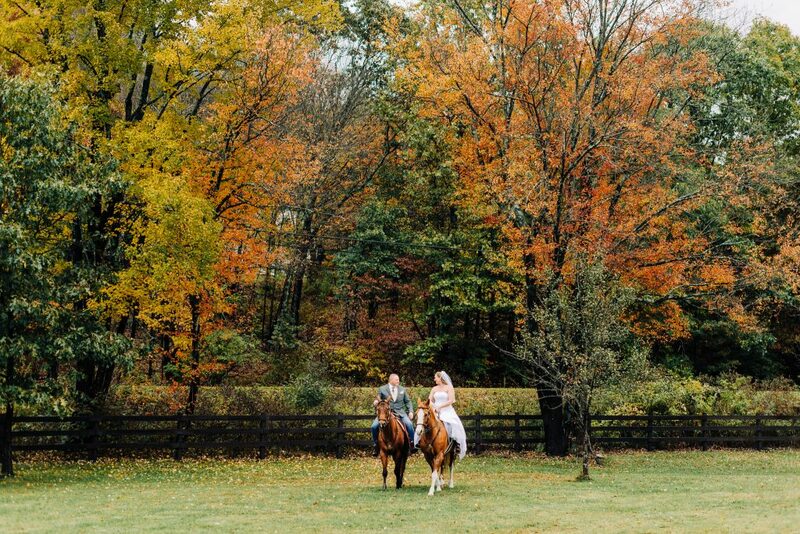 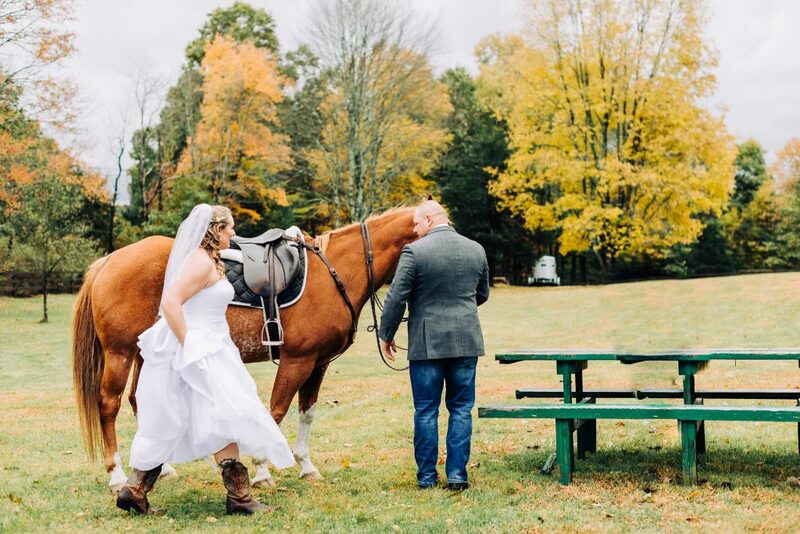 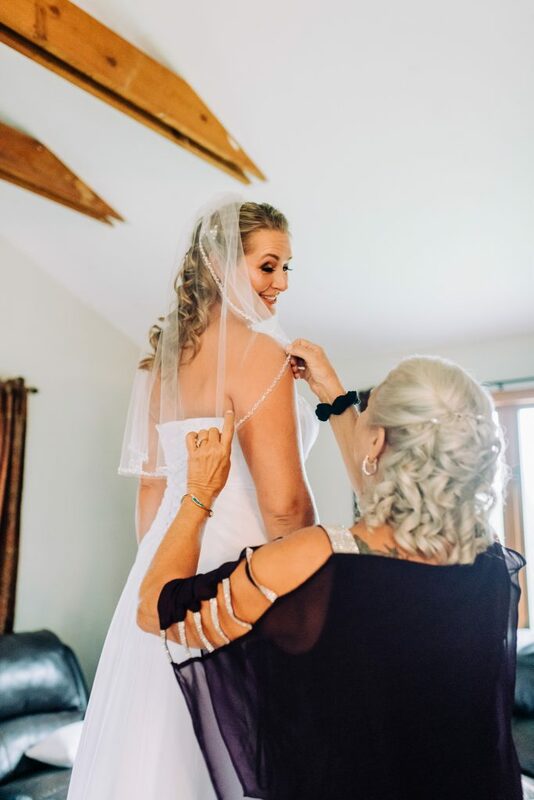 The first look was done at the bride’s home, and while a light rain that morning had gotten the grounds a little muddy, nothing stopped the awesome bride from riding her horse. 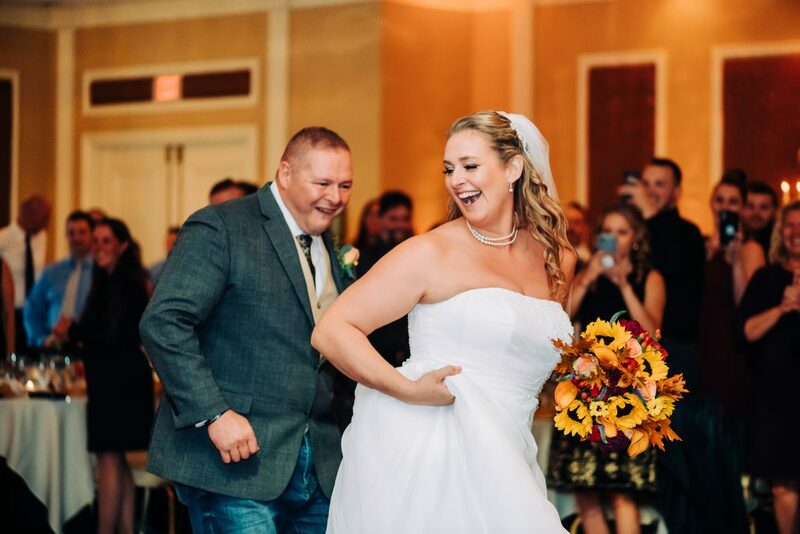 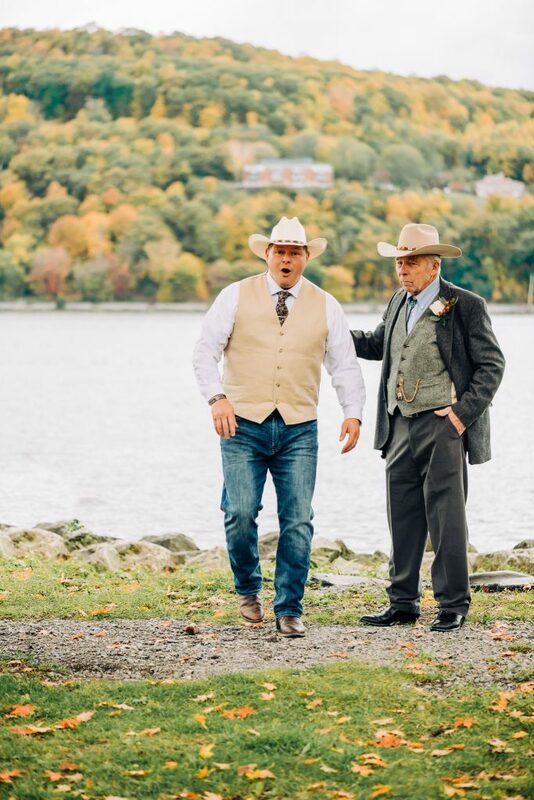 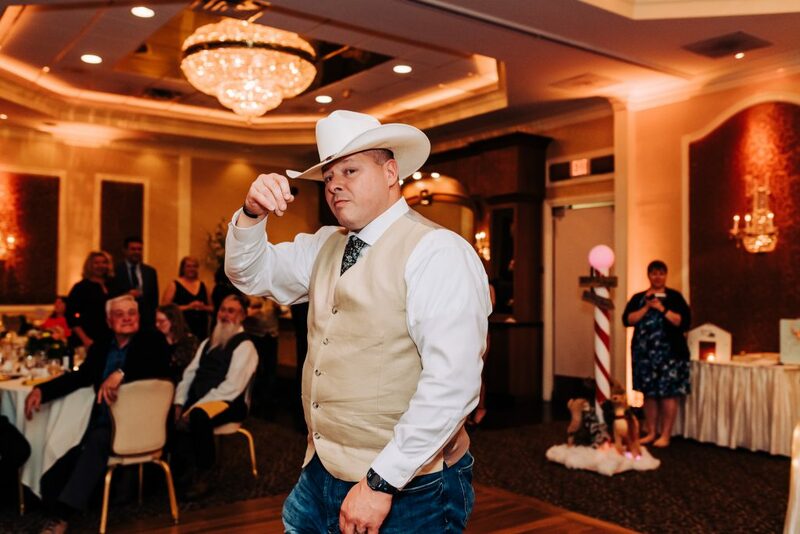 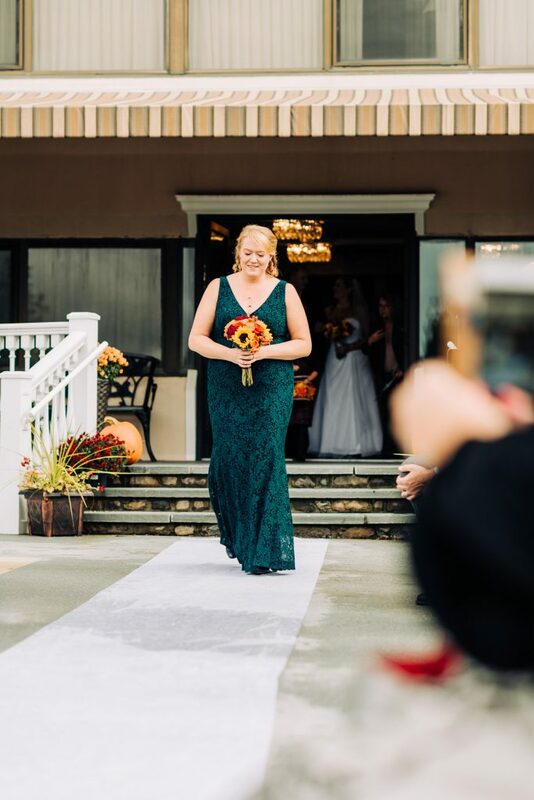 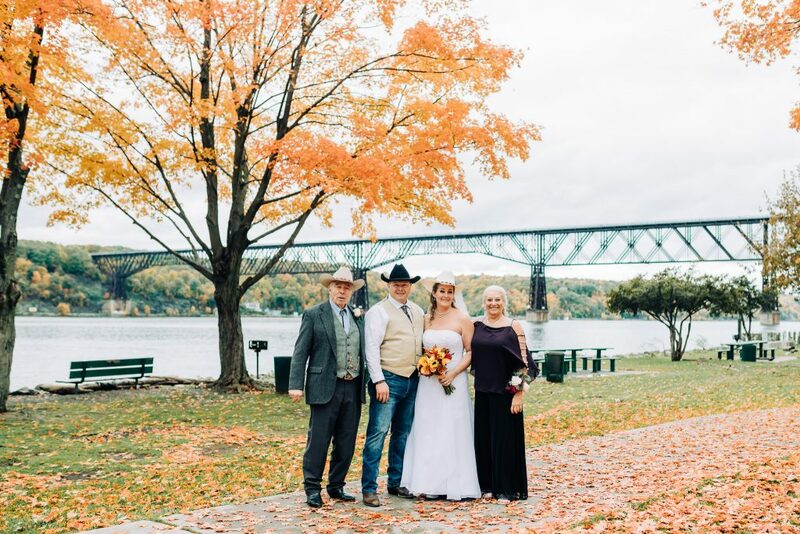 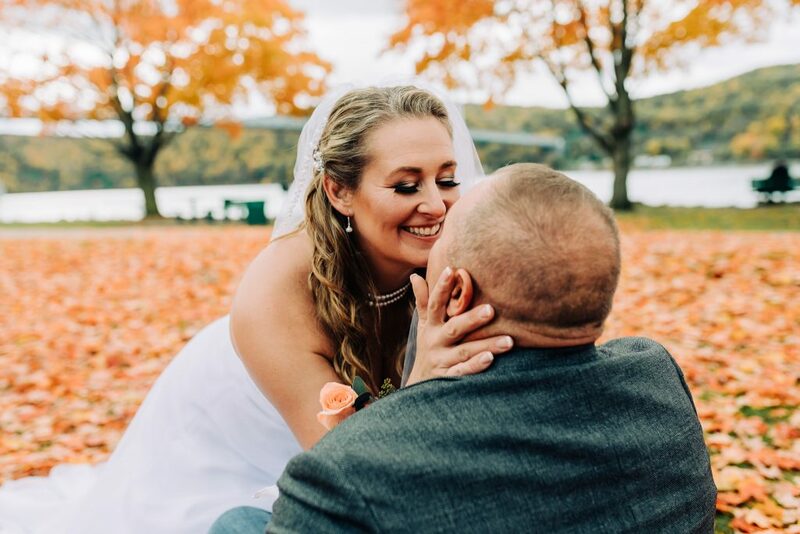 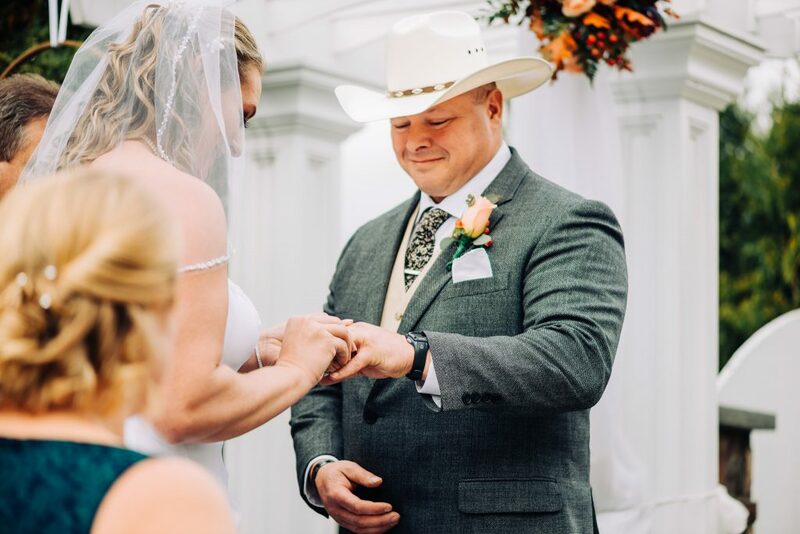 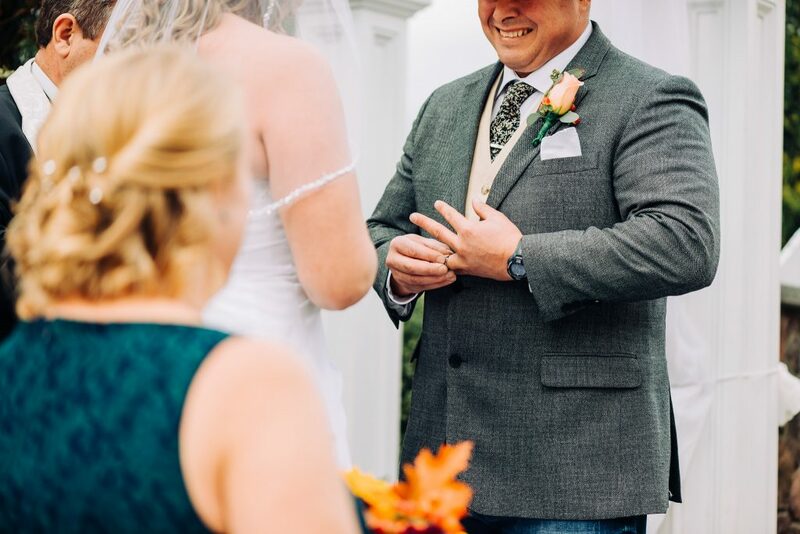 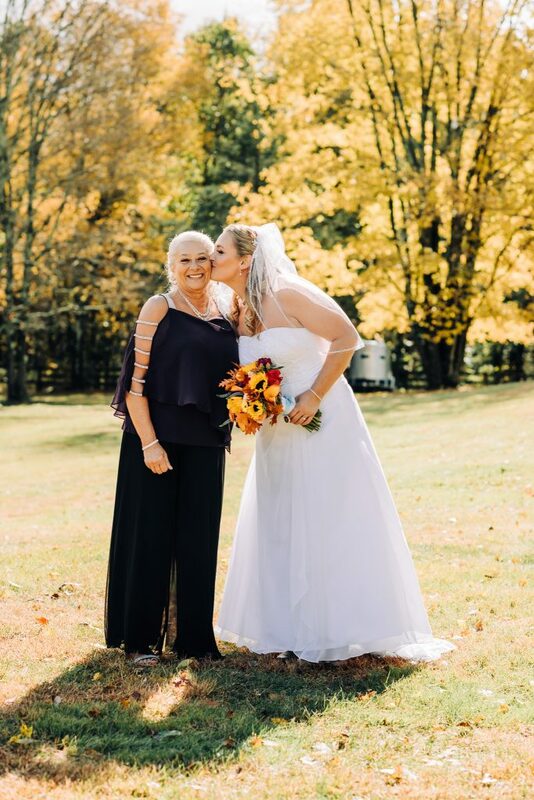 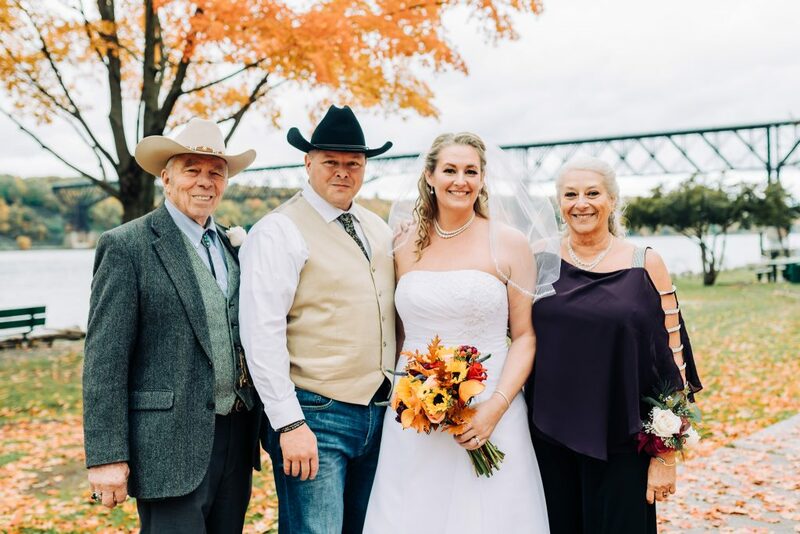 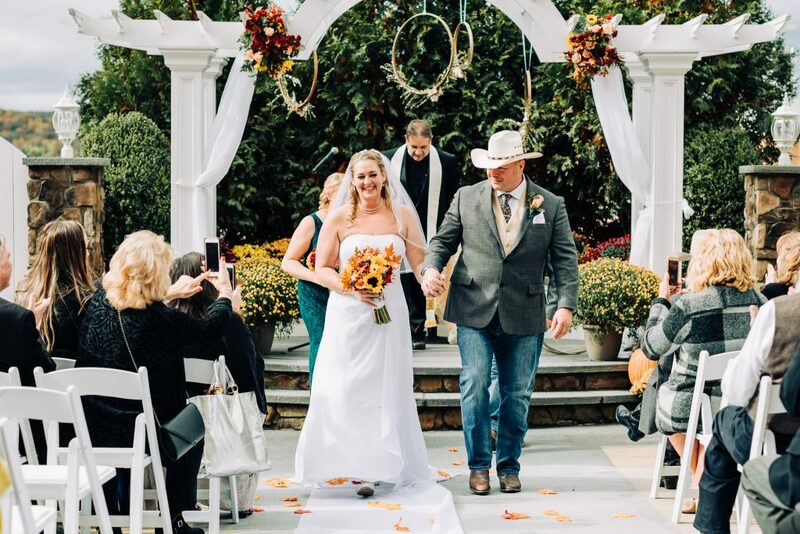 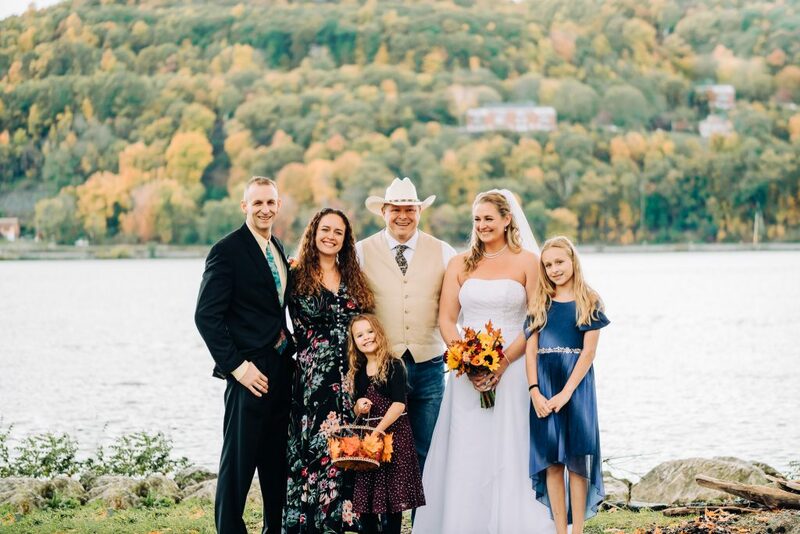 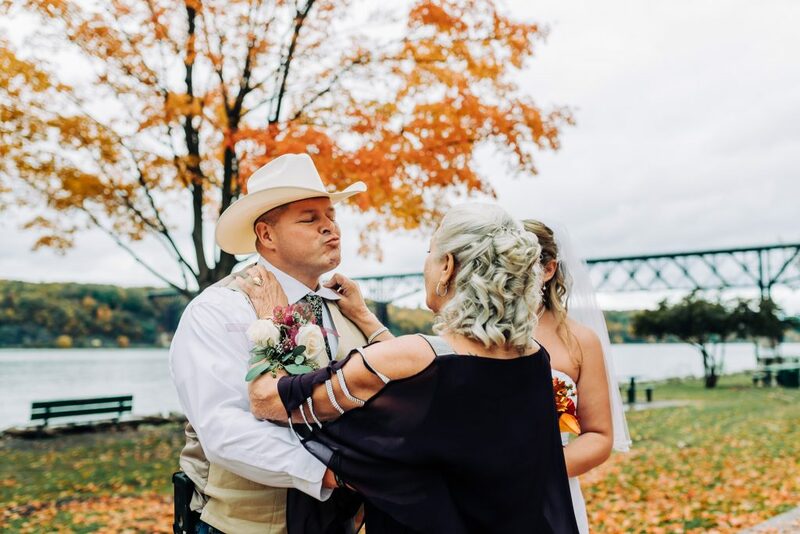 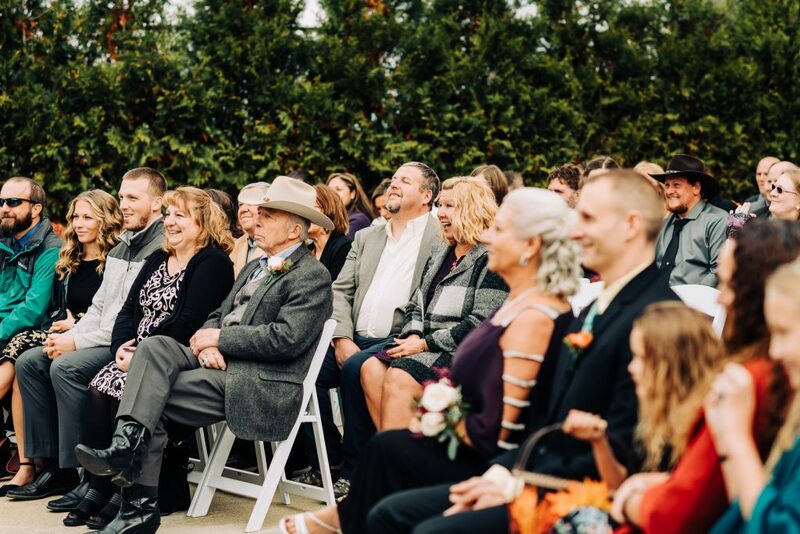 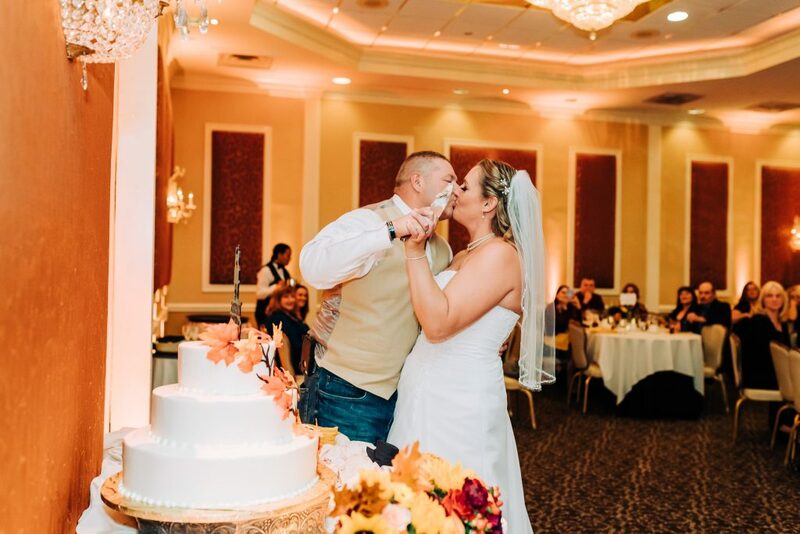 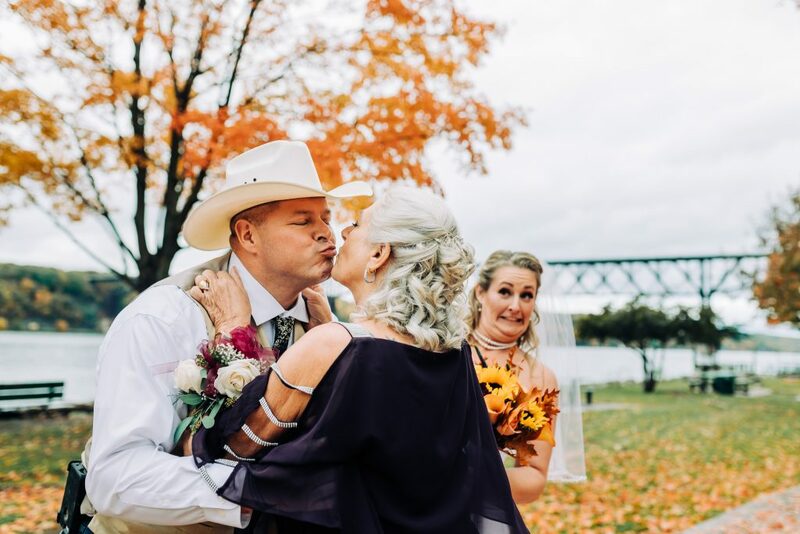 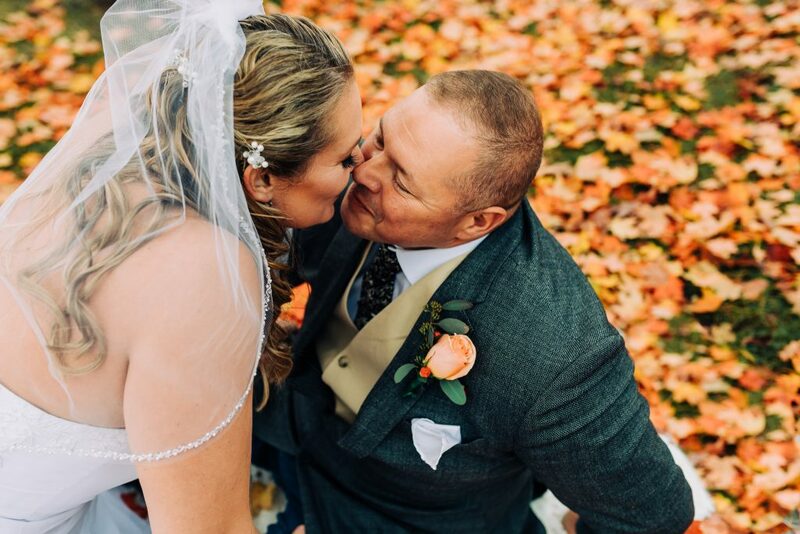 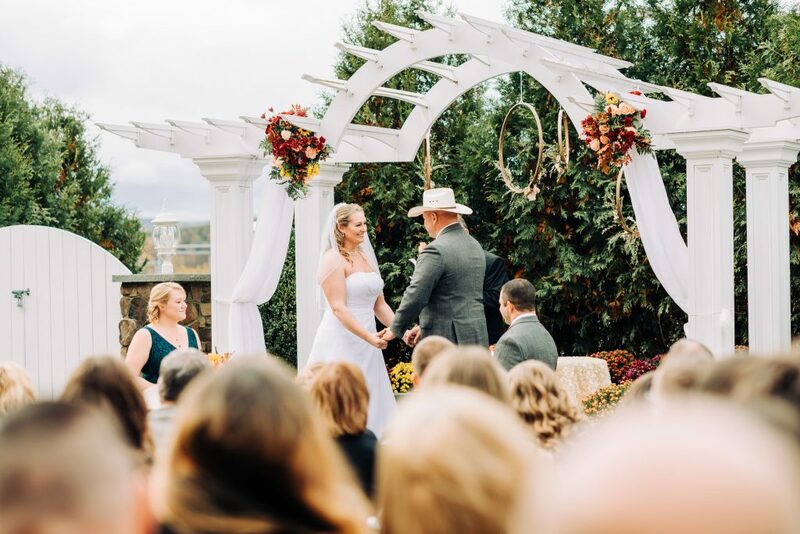 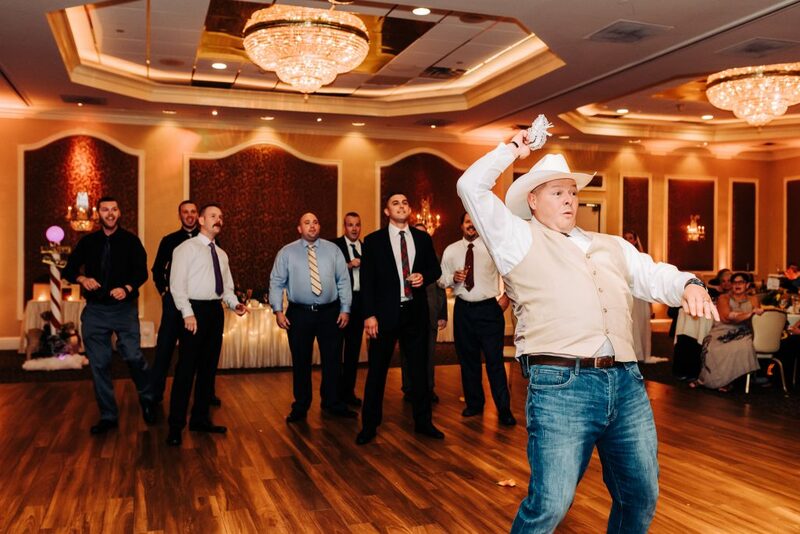 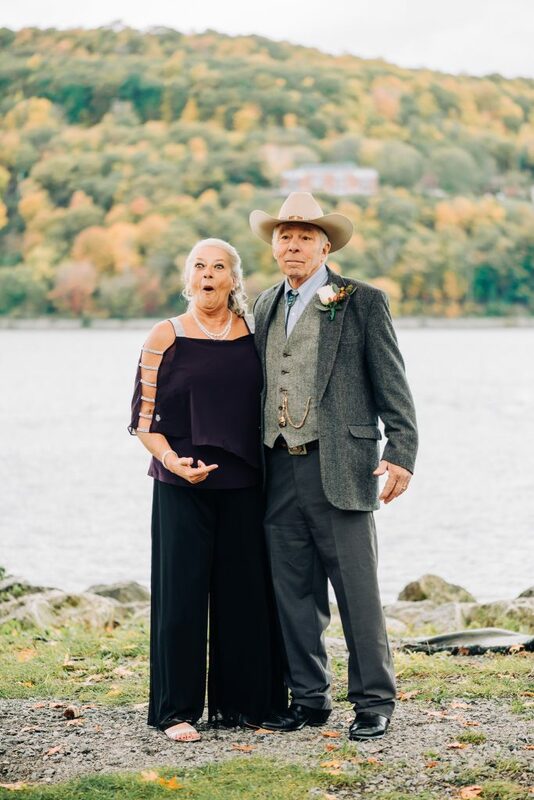 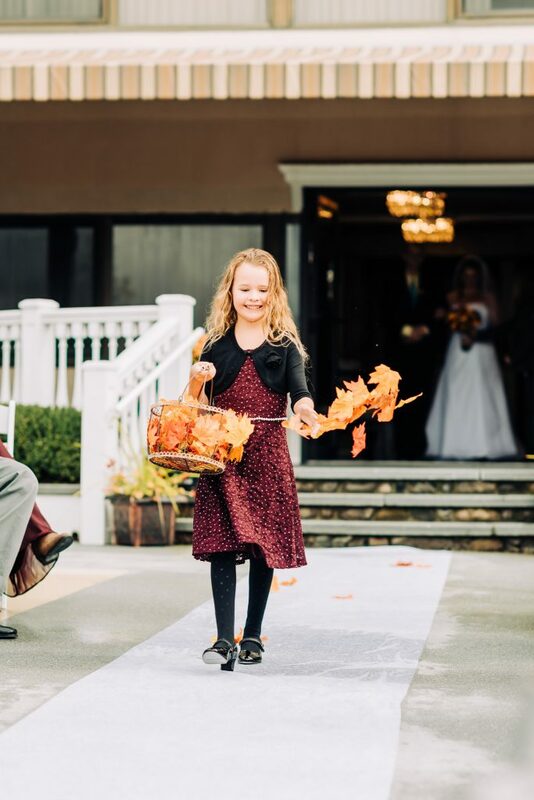 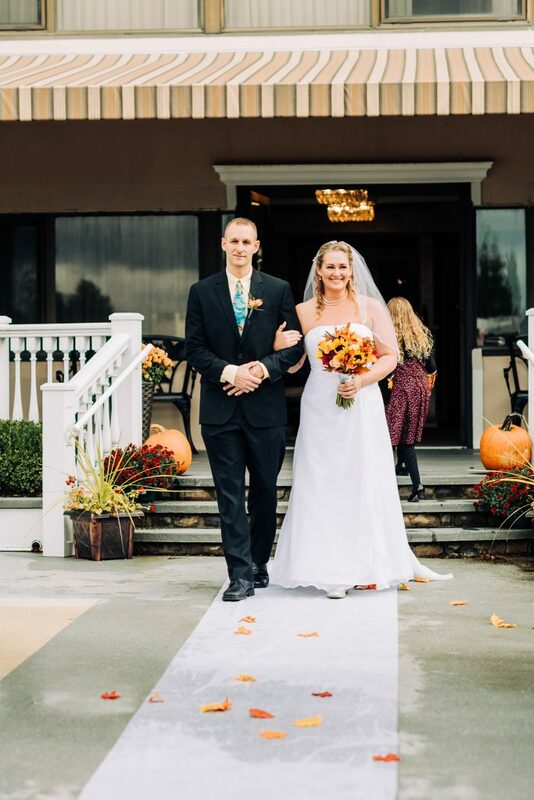 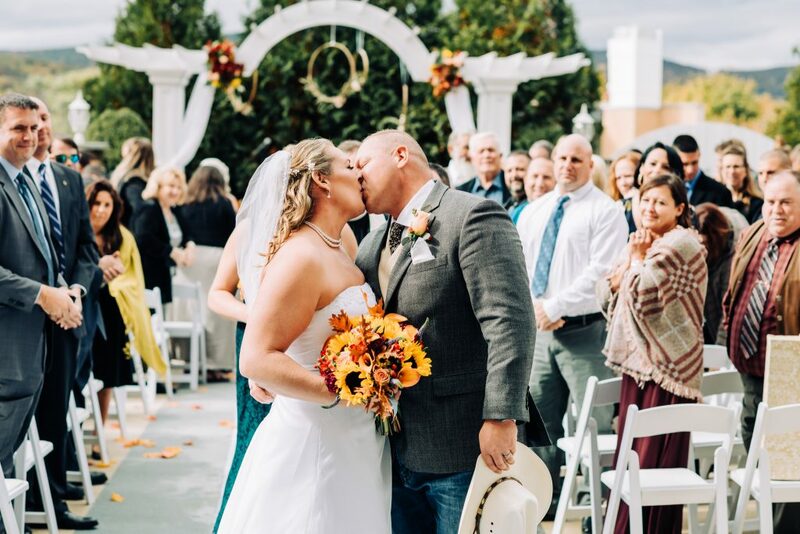 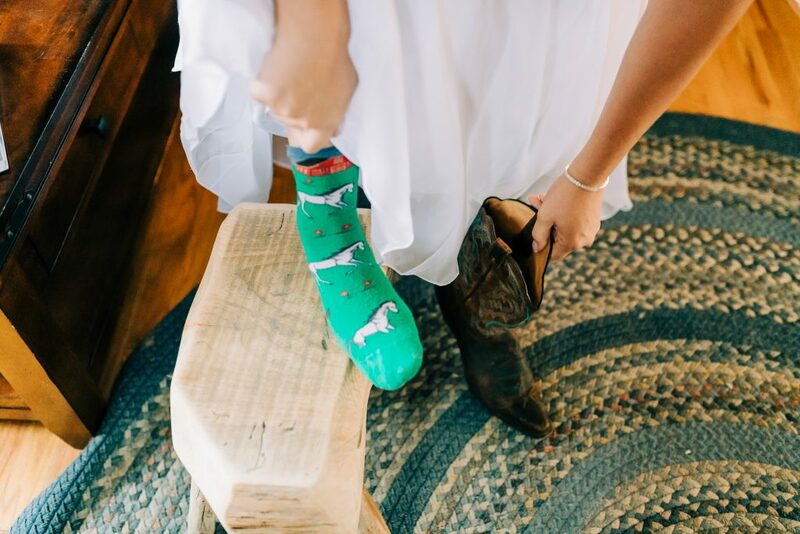 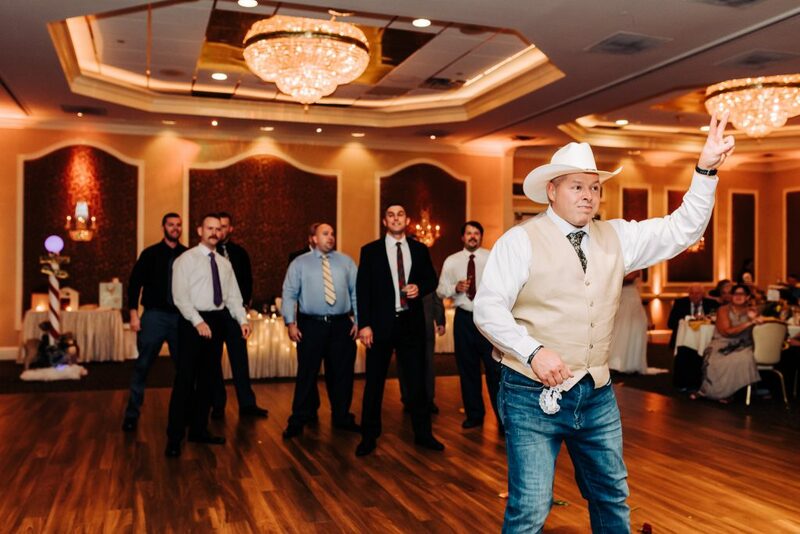 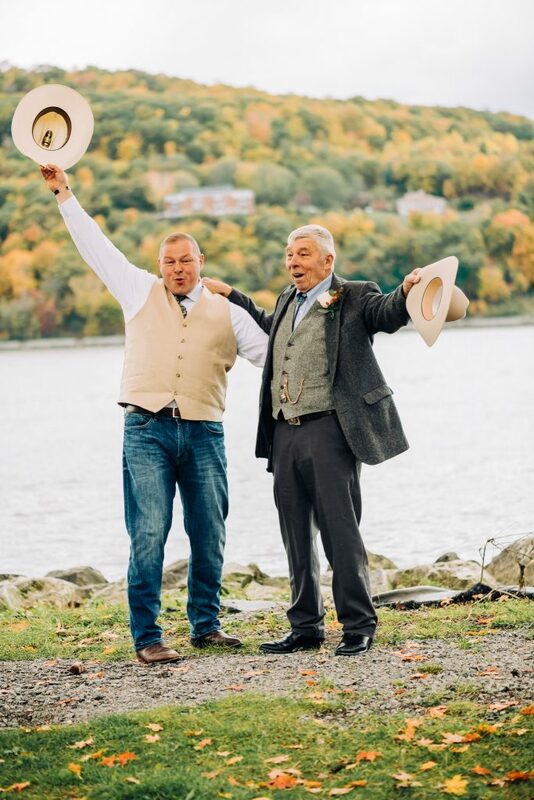 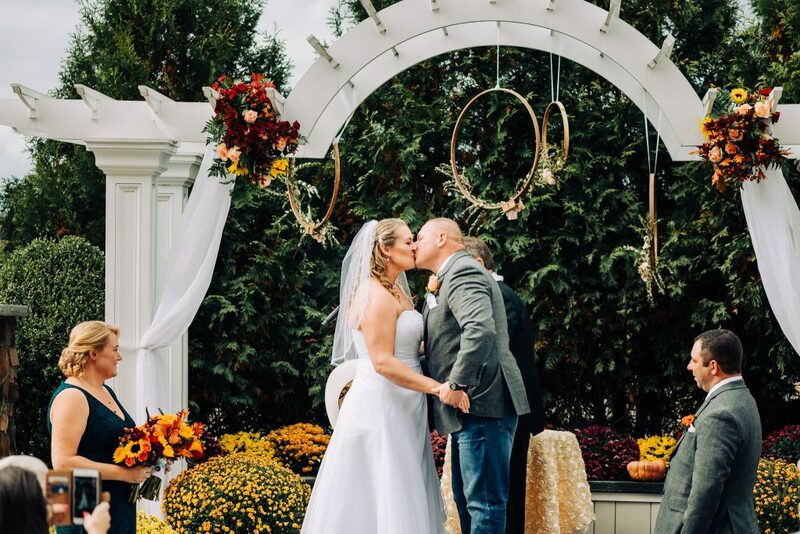 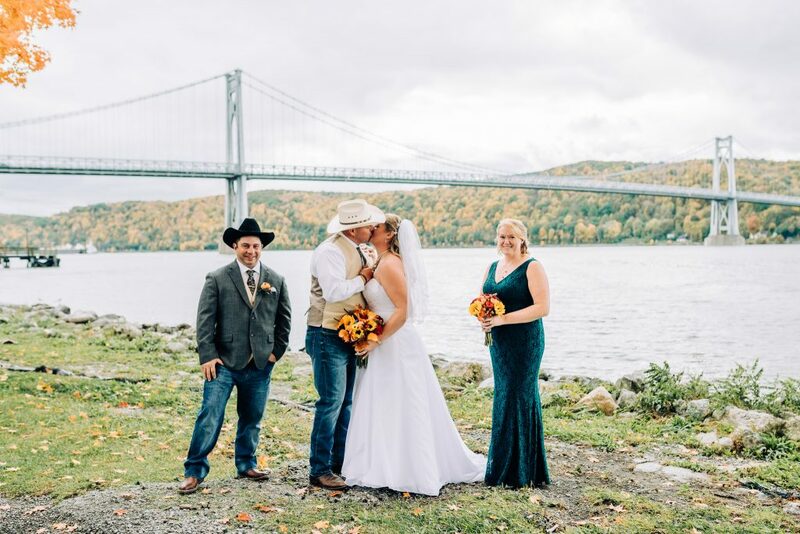 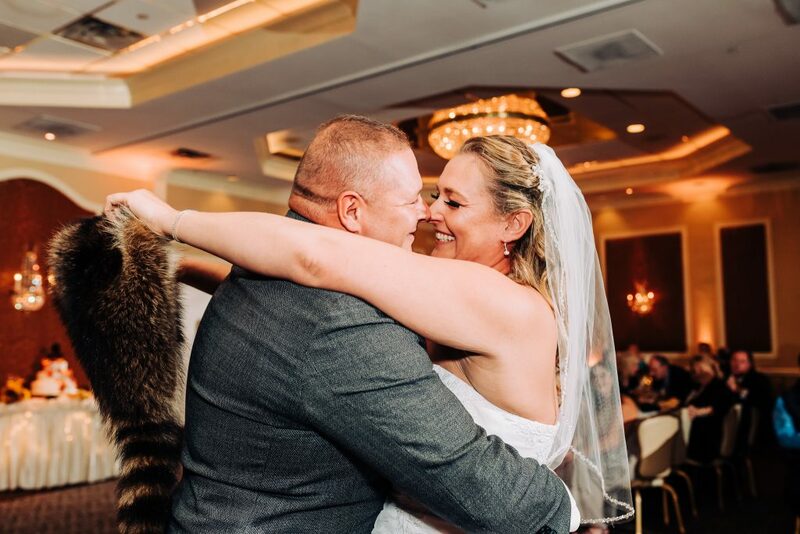 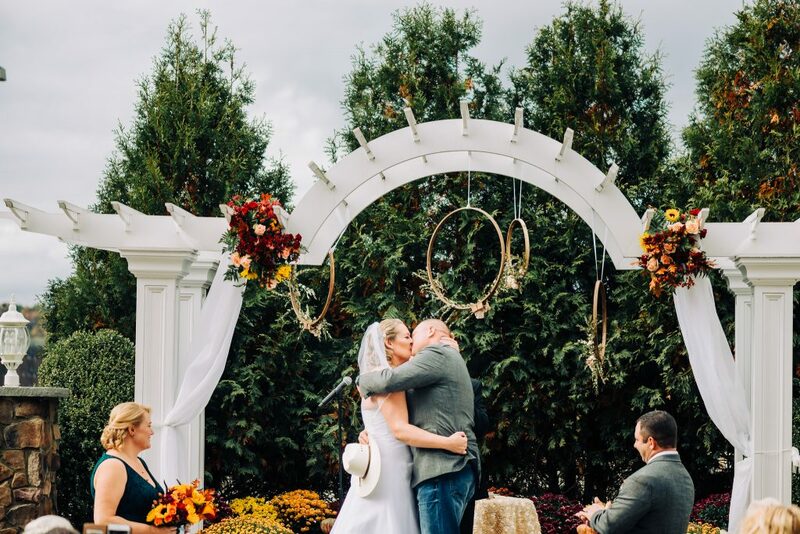 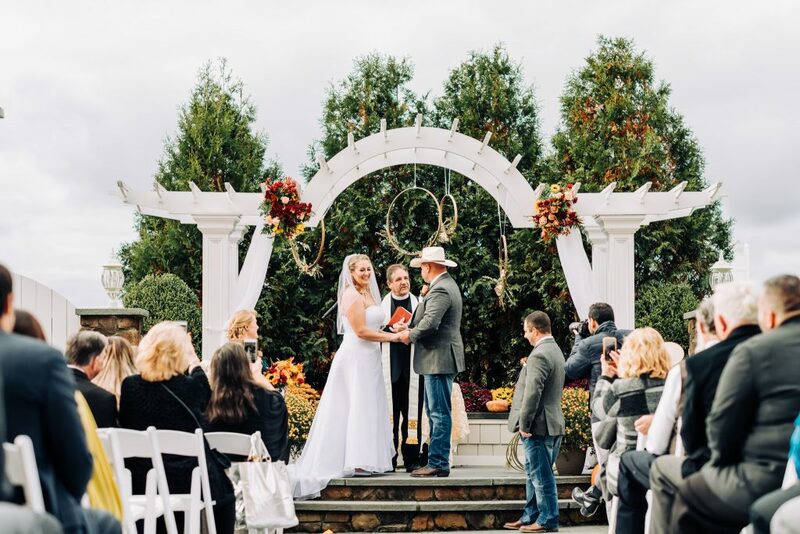 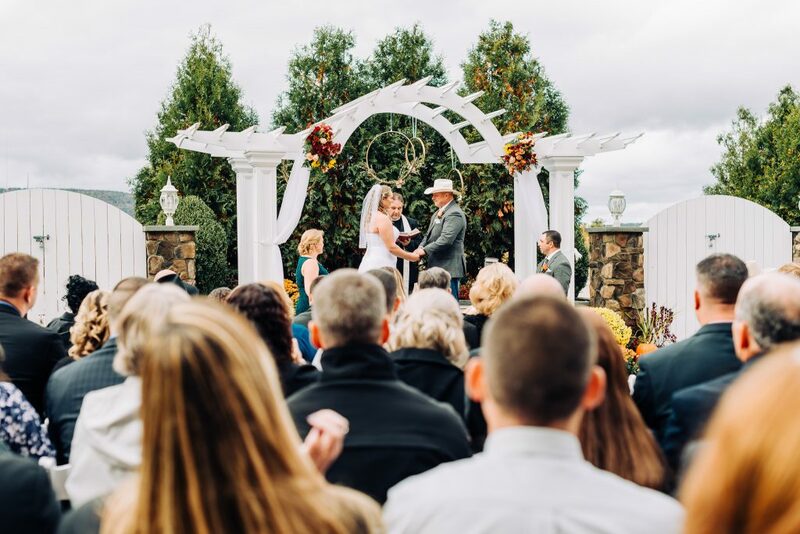 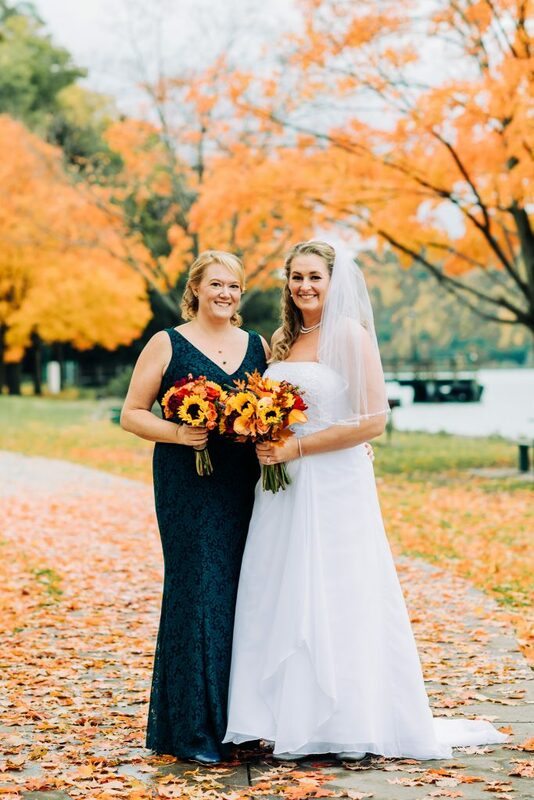 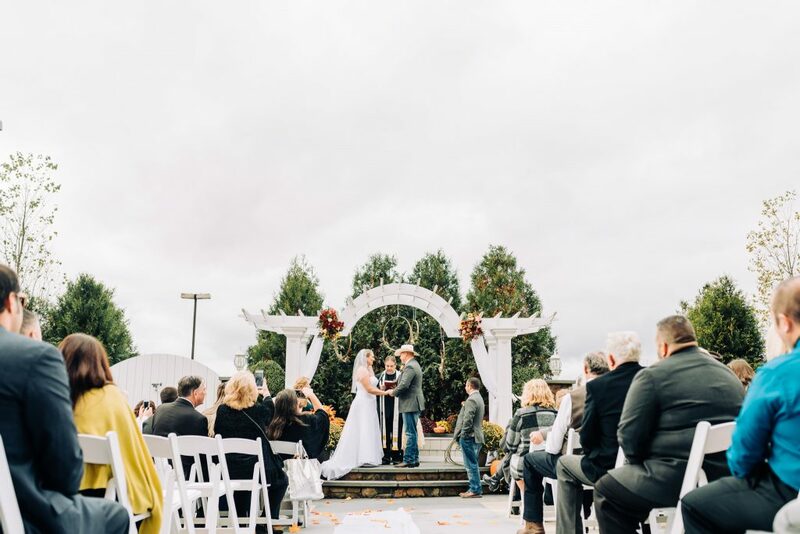 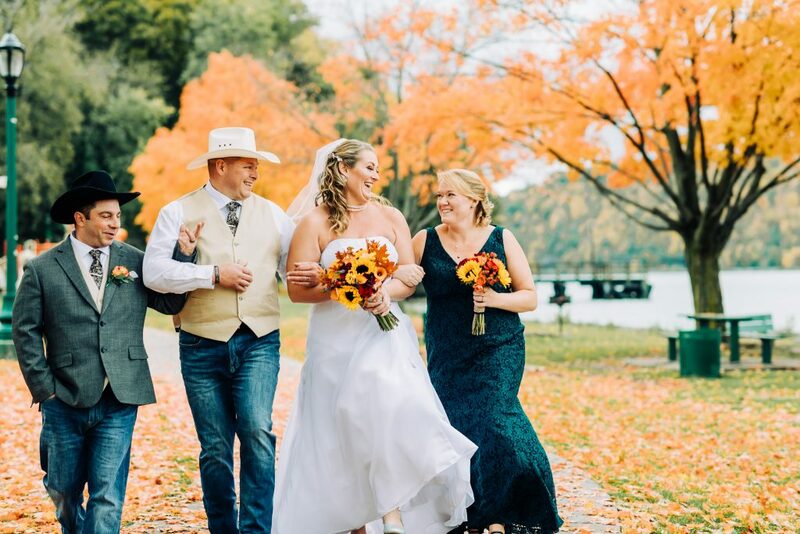 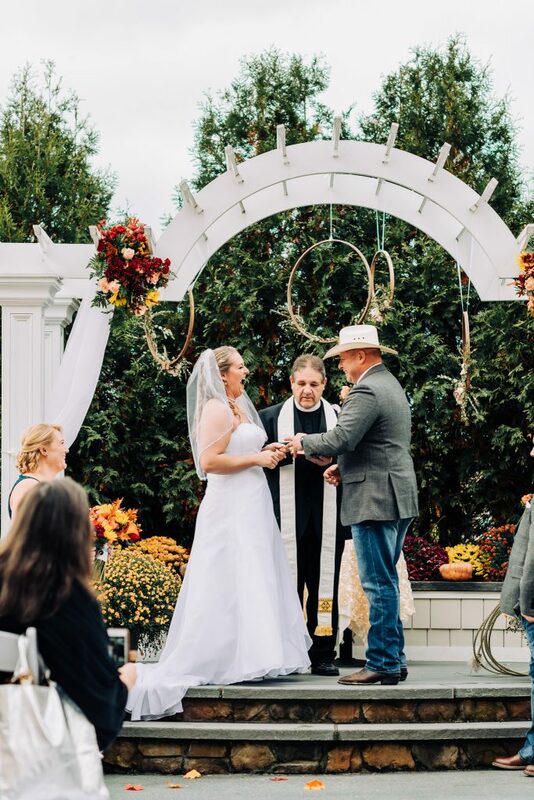 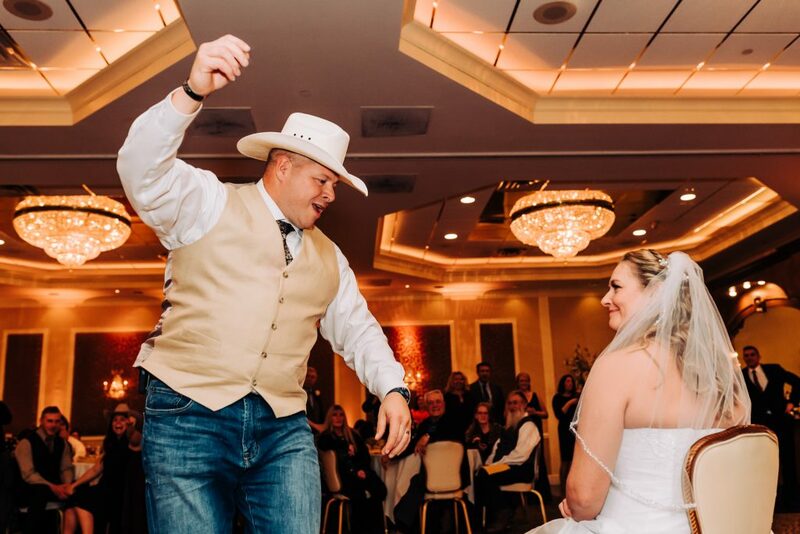 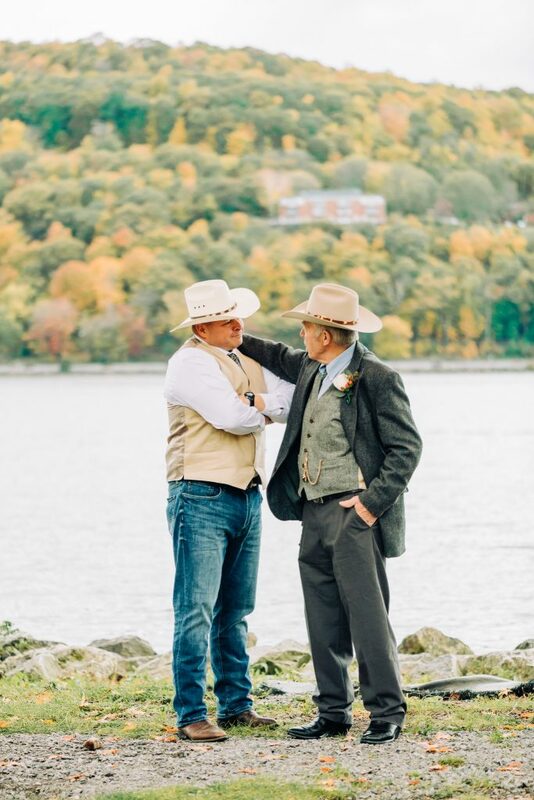 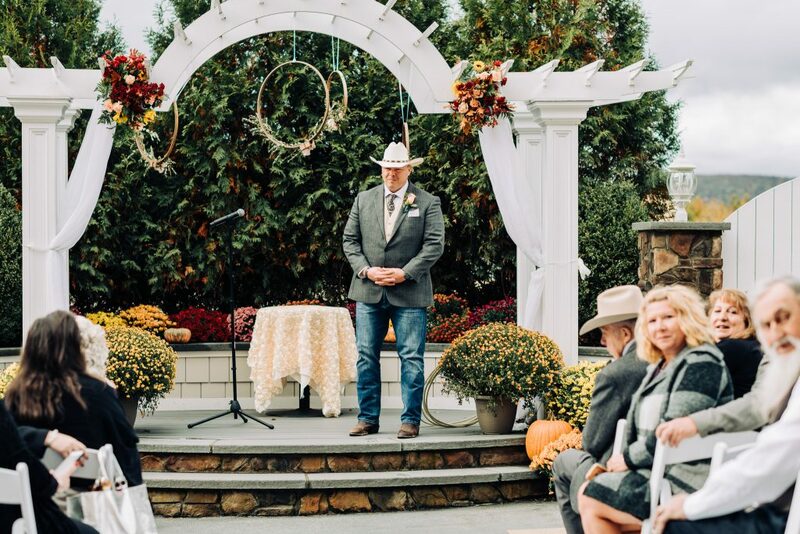 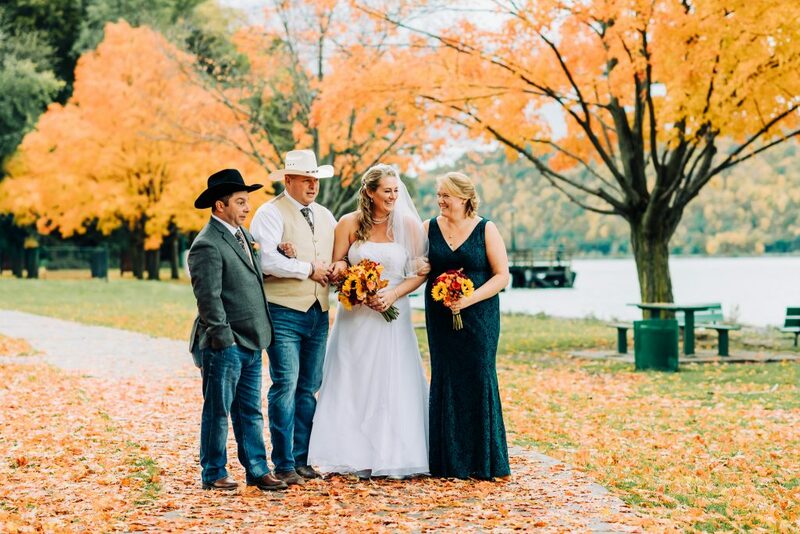 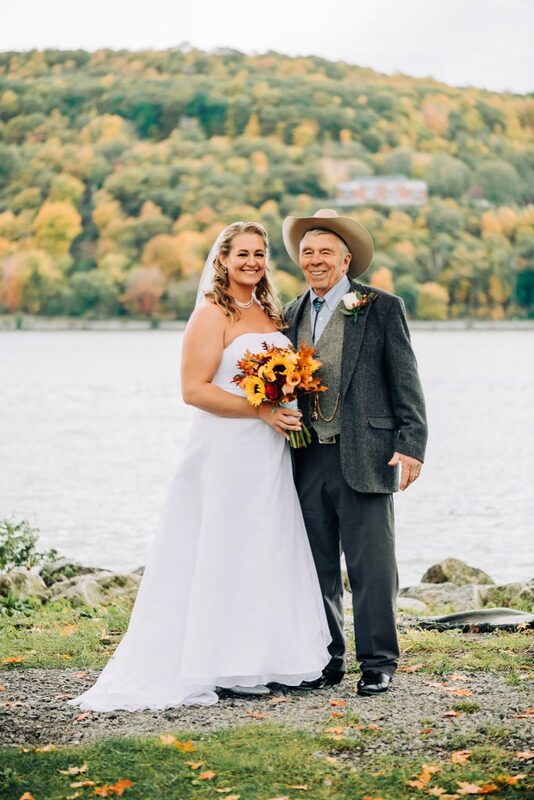 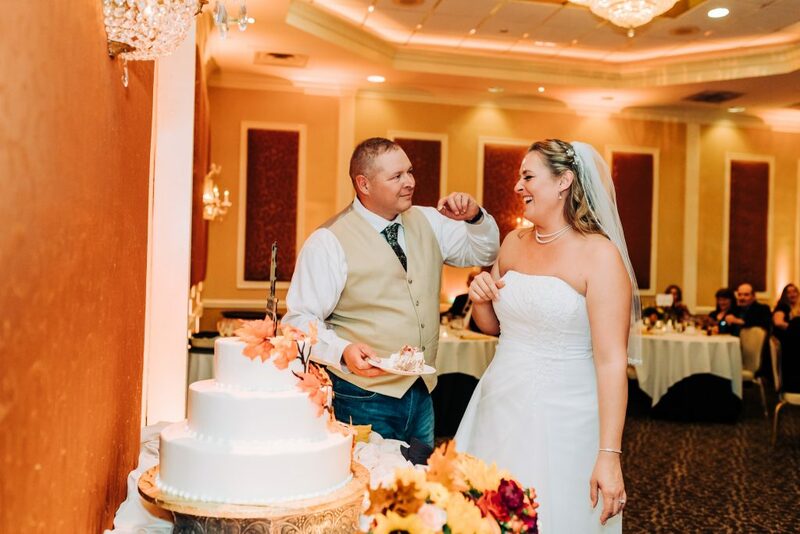 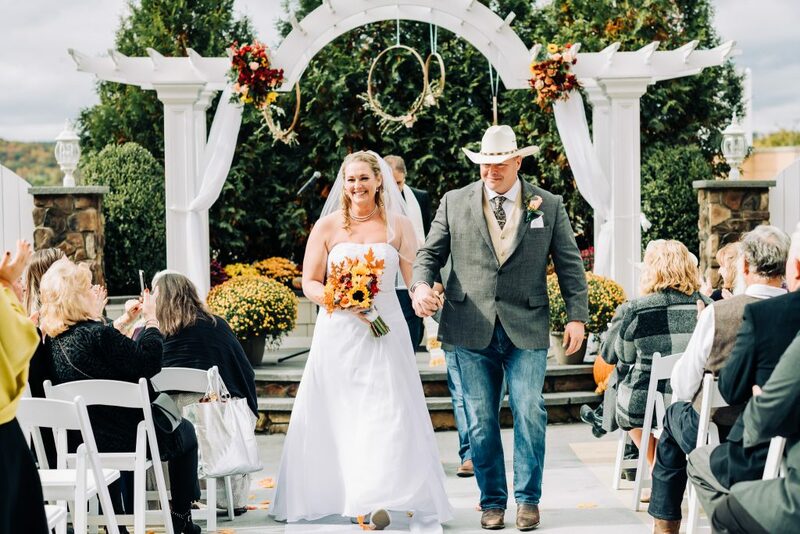 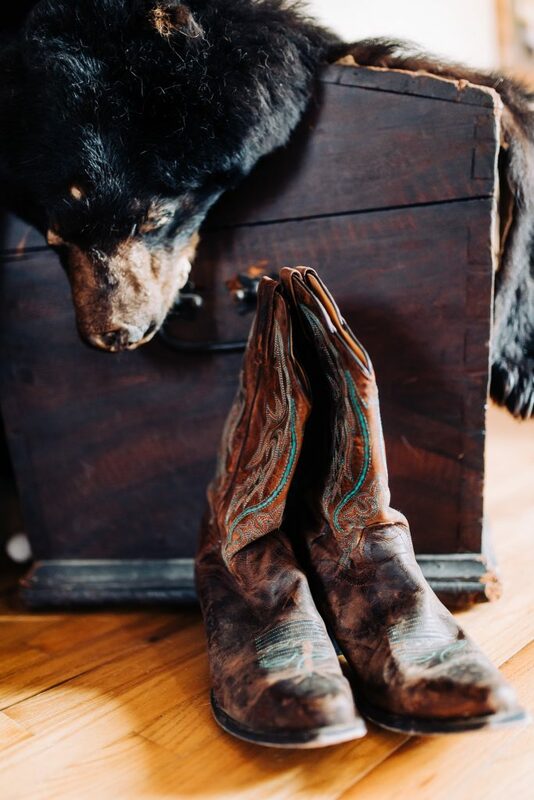 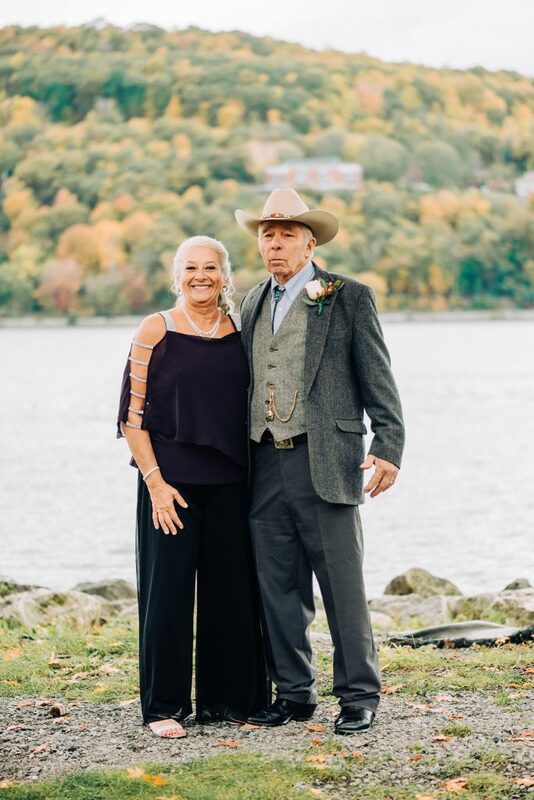 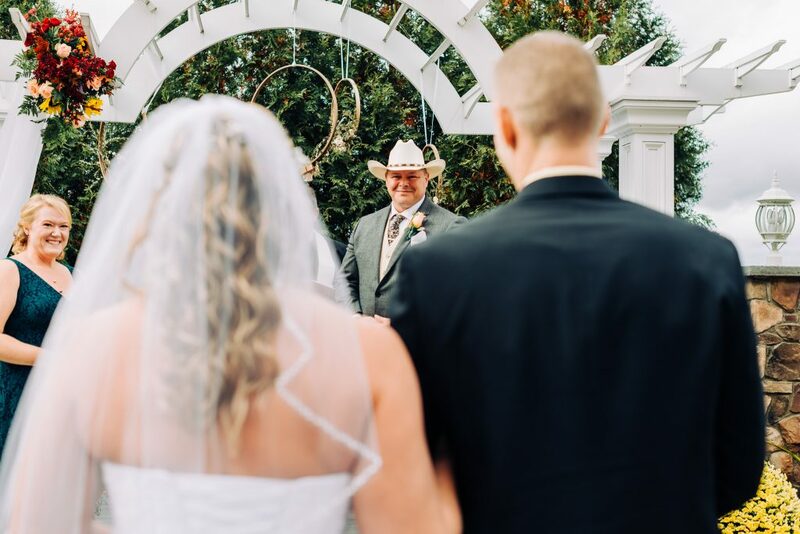 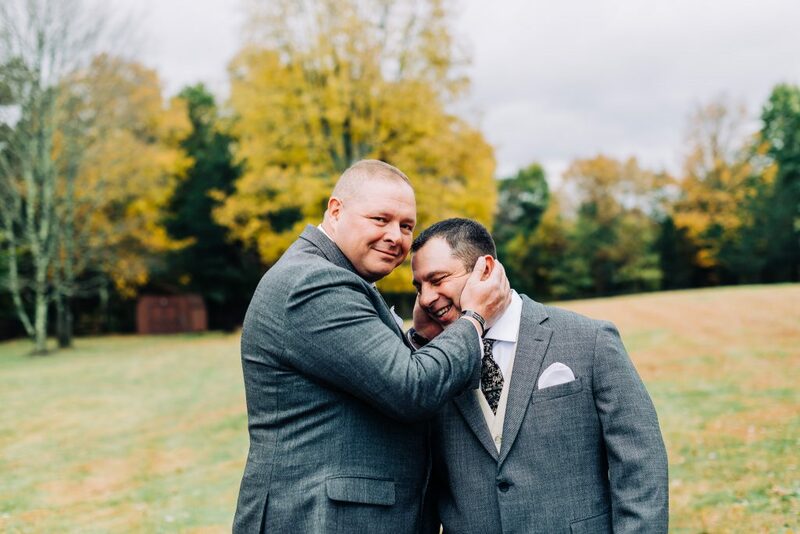 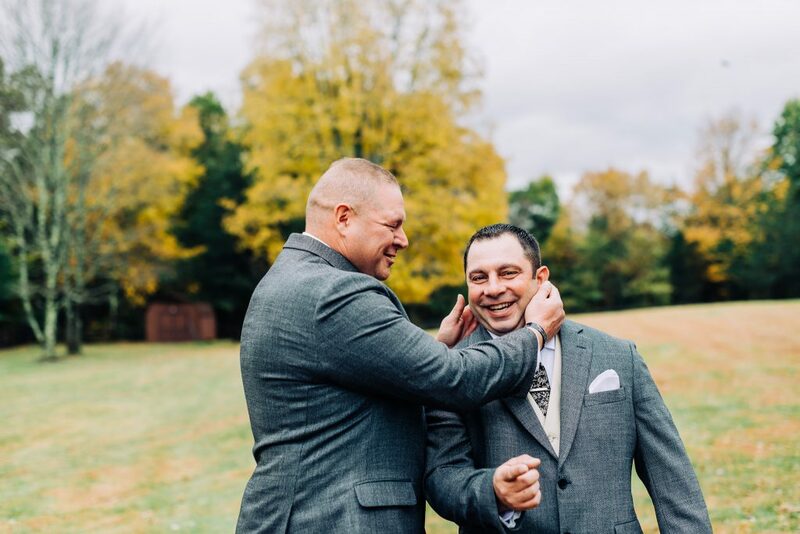 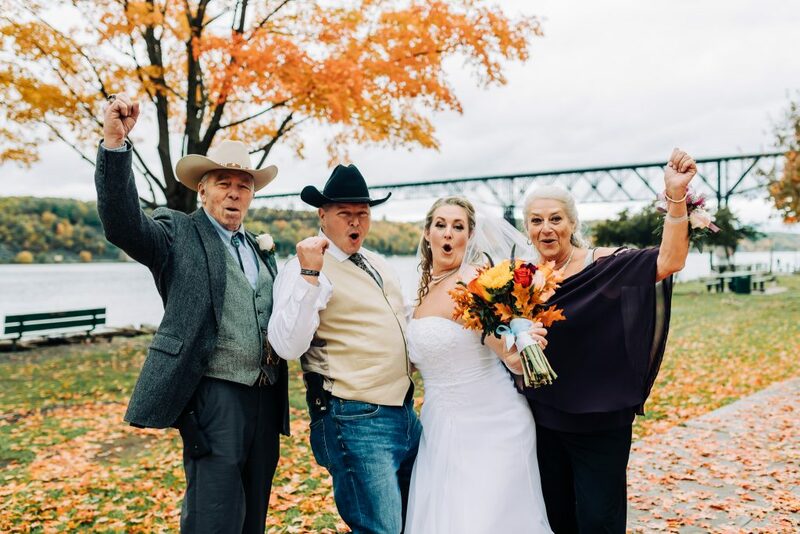 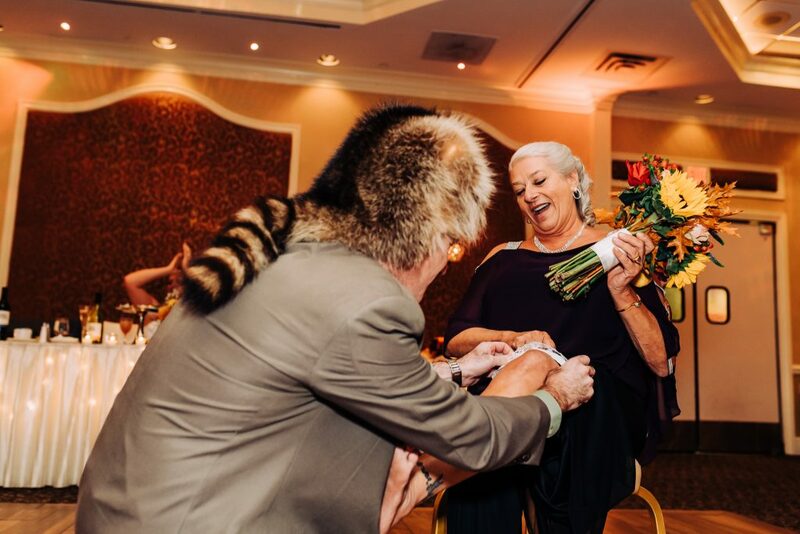 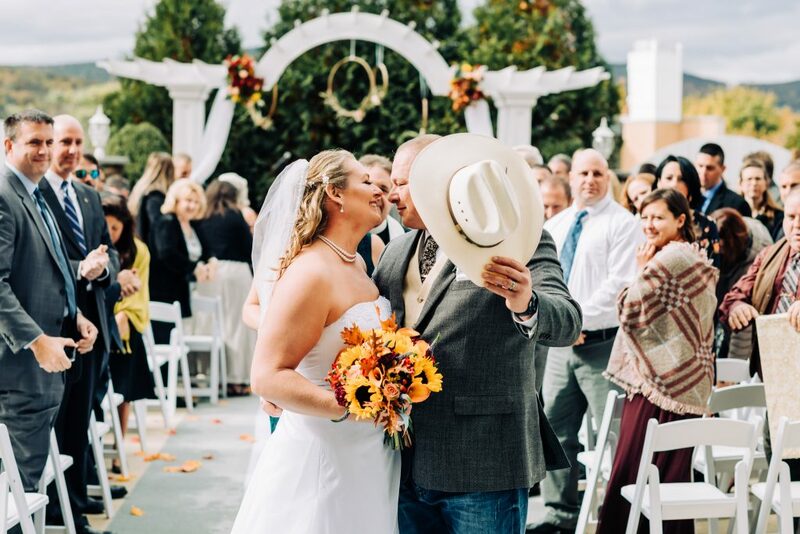 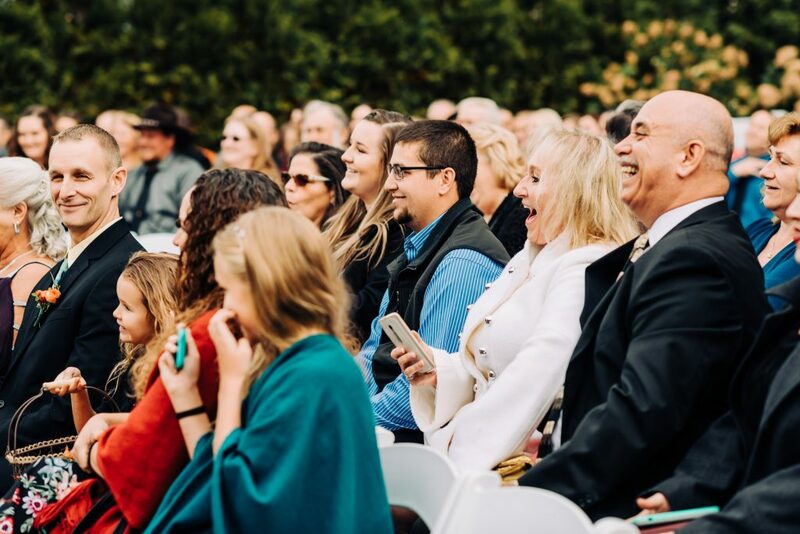 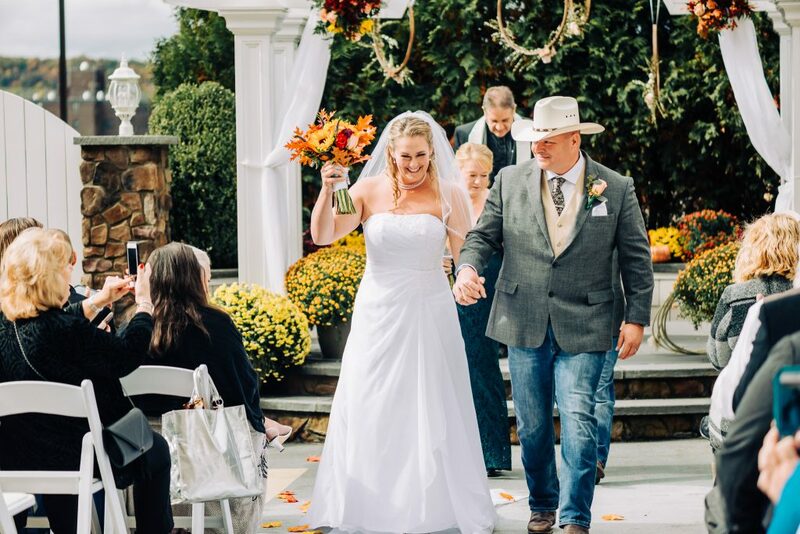 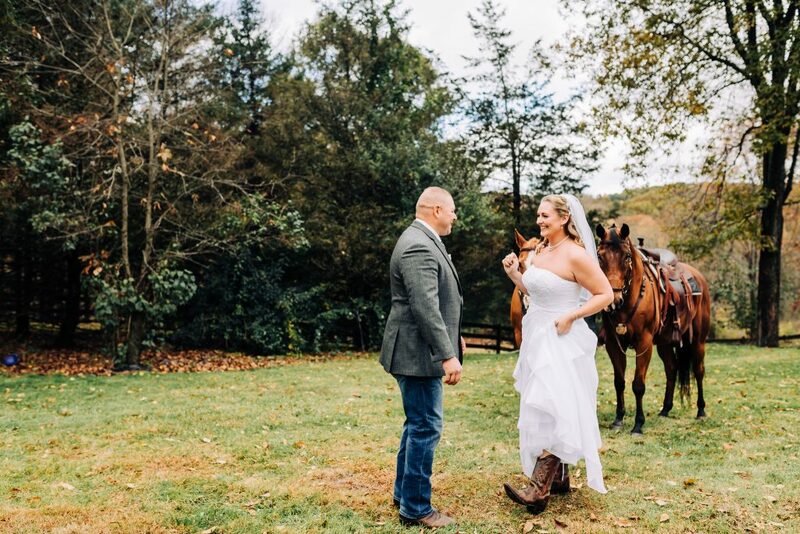 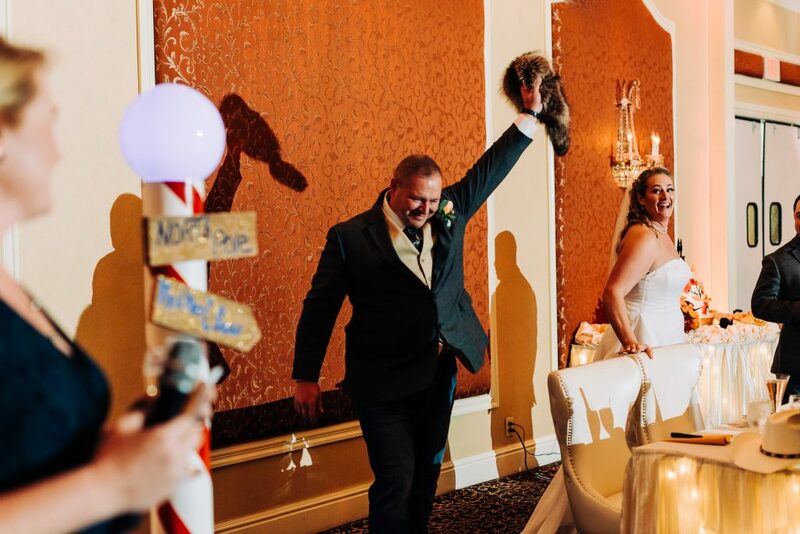 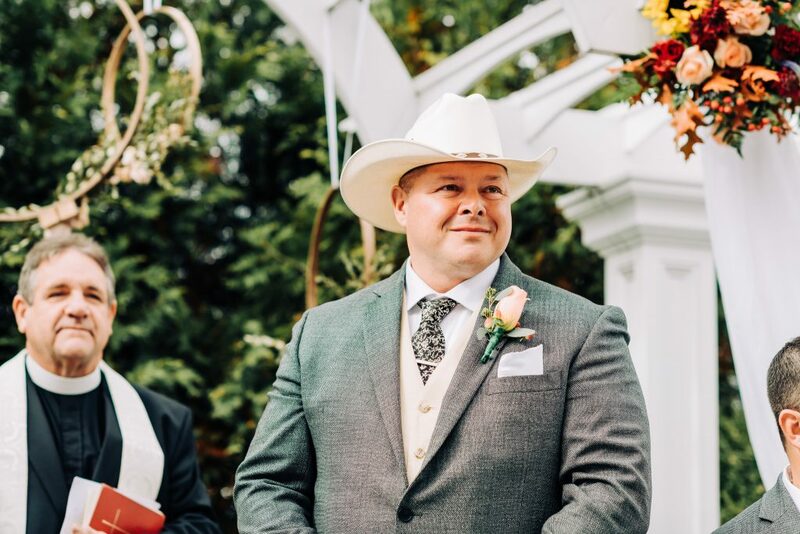 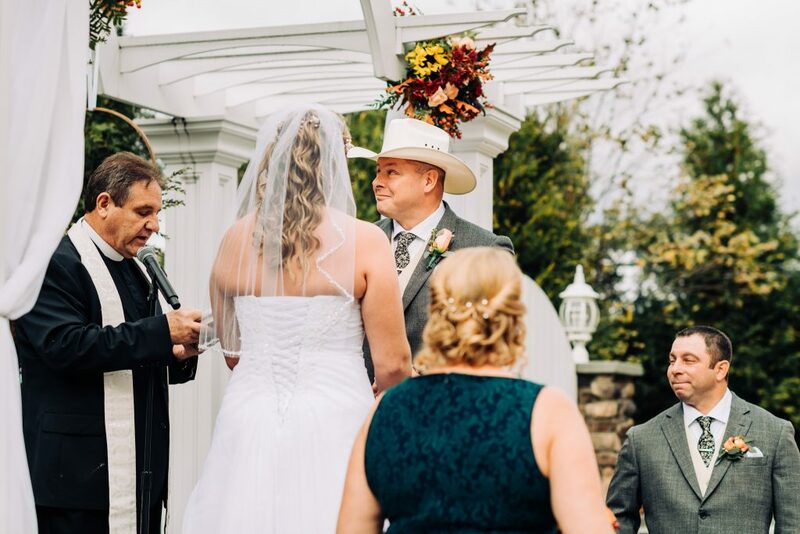 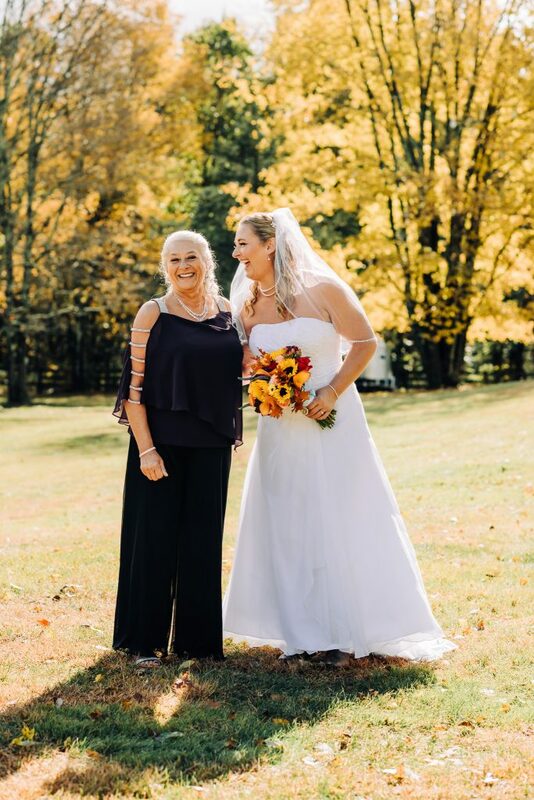 The outdoor ceremony and the reception at of the Poughkeepsie Grand Hotel were filled with love, laughter, and cowboy boots. 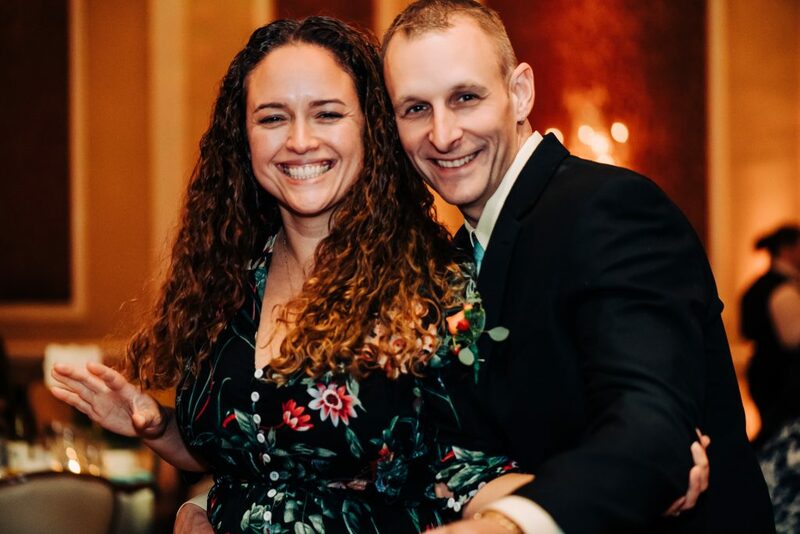 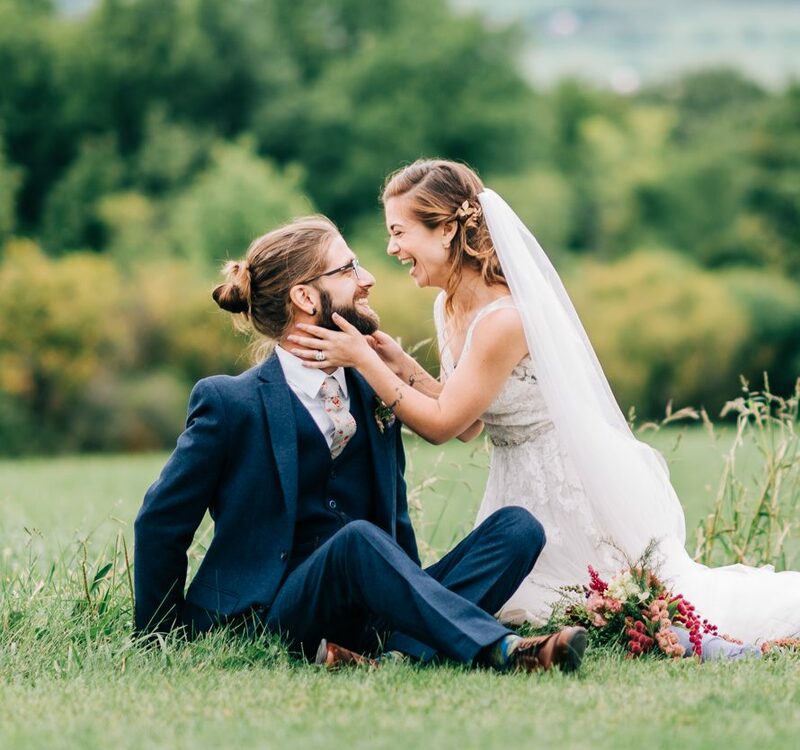 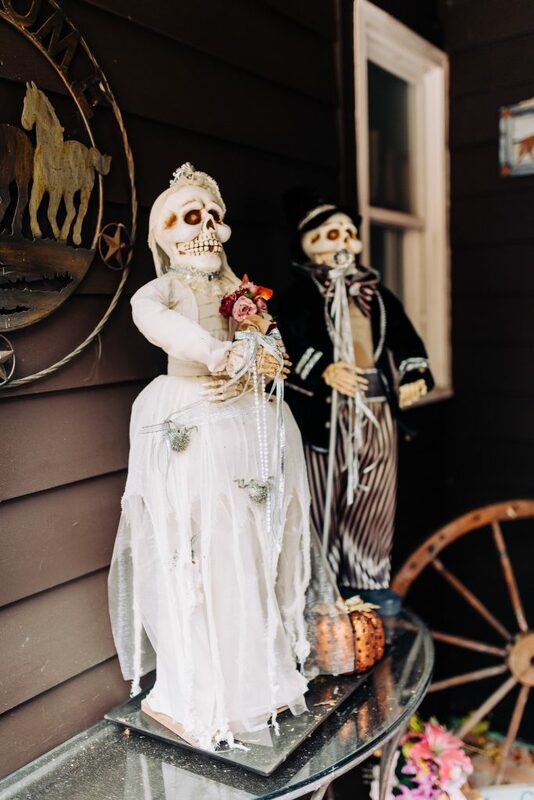 I am a sucker for couples that are crazy about each other, and these two absolutely looked like teenagers in love. 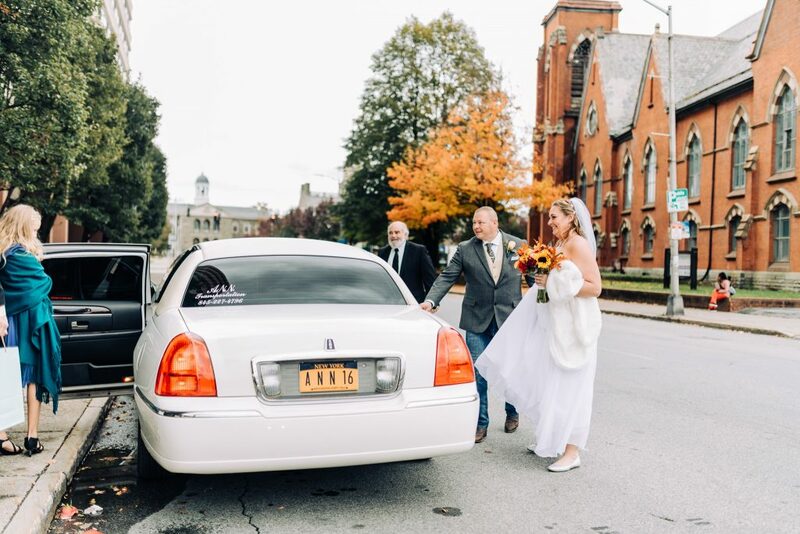 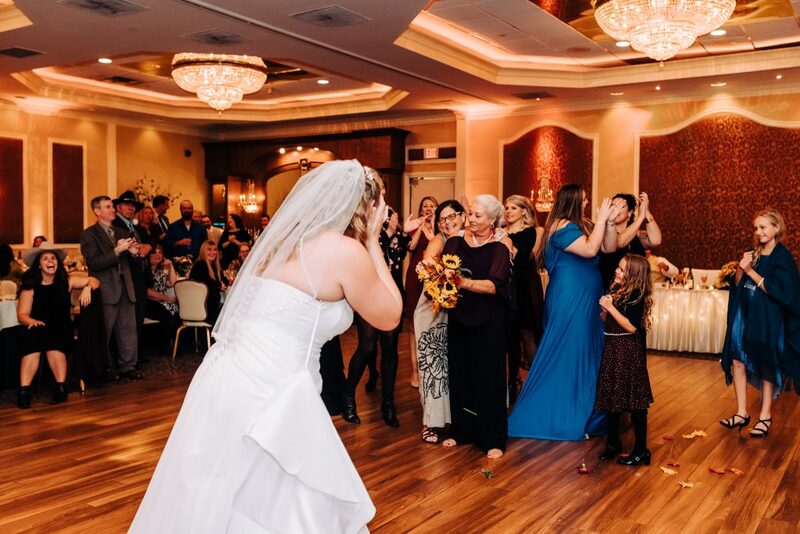 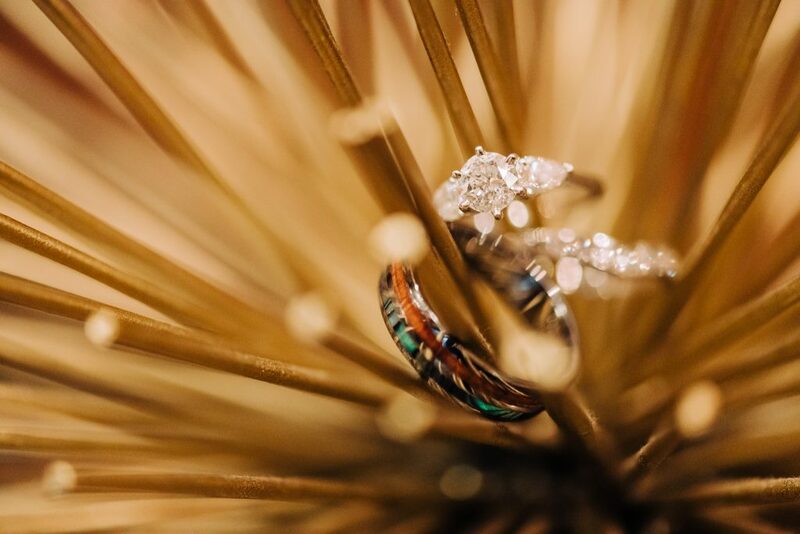 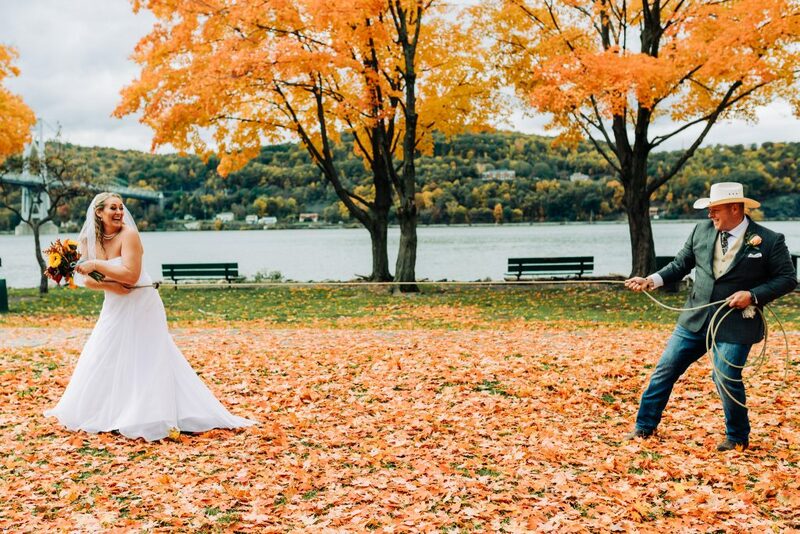 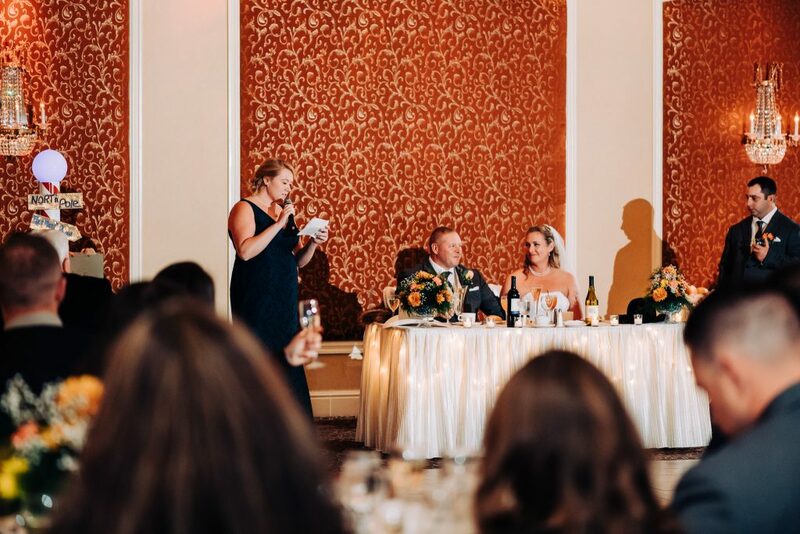 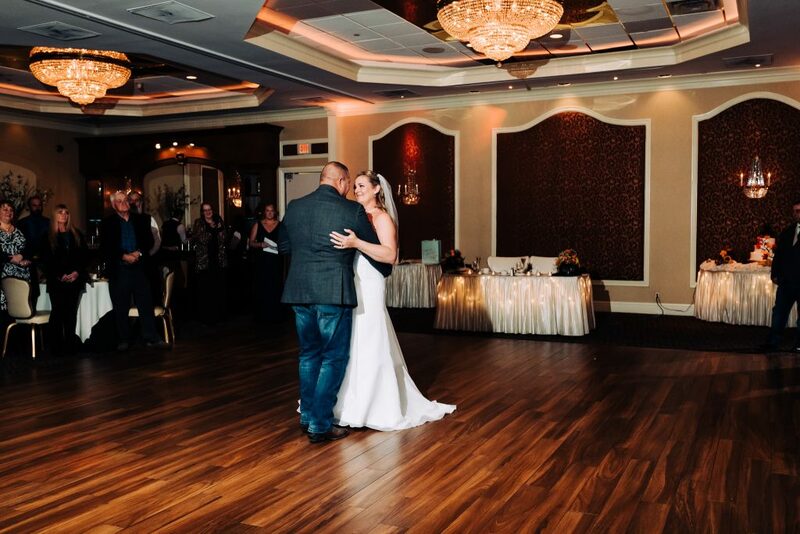 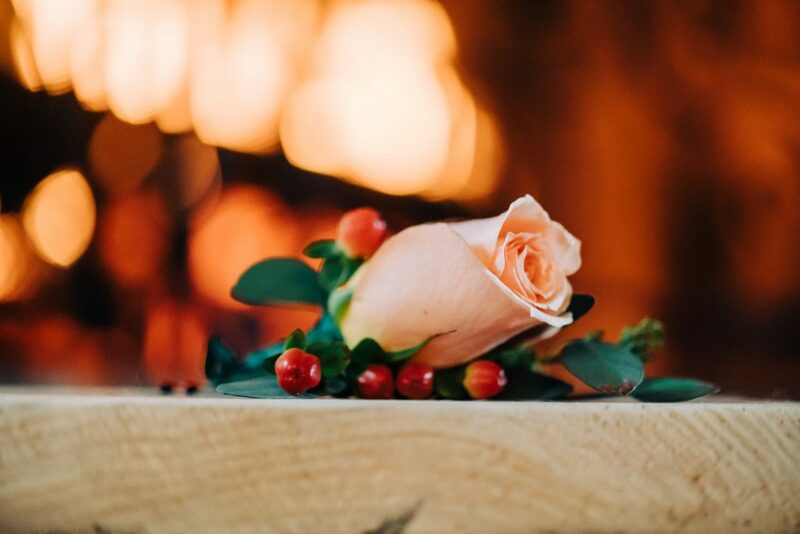 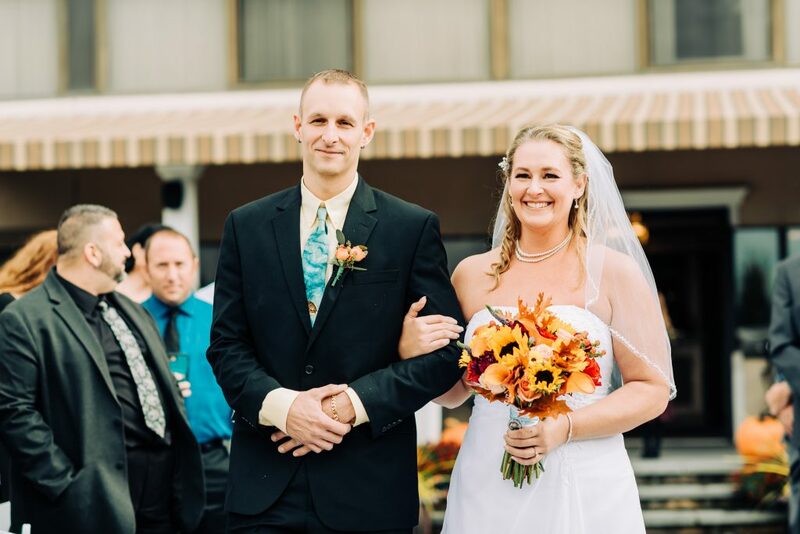 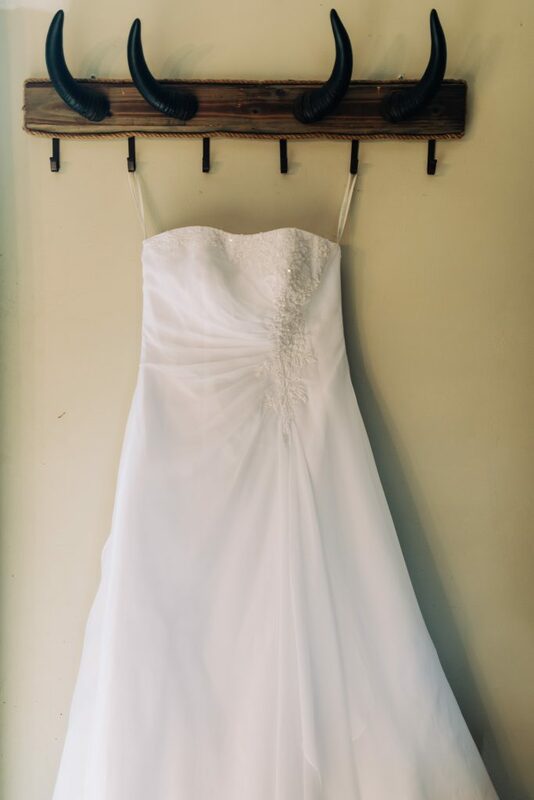 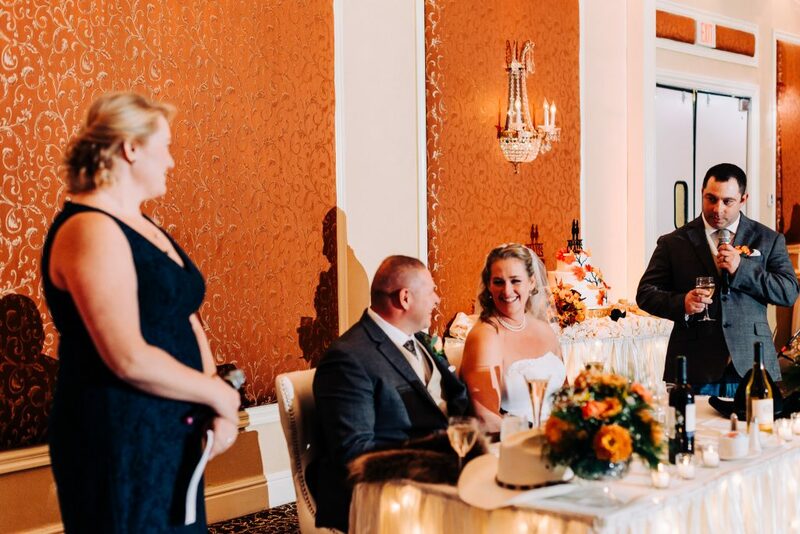 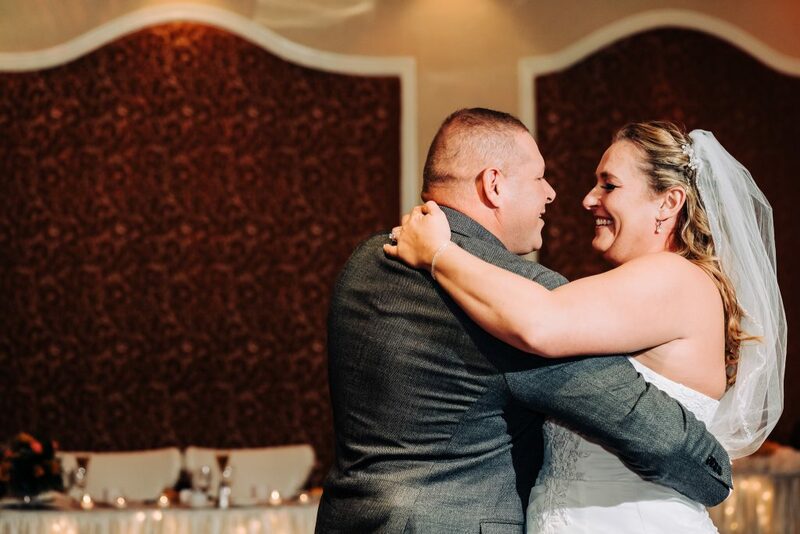 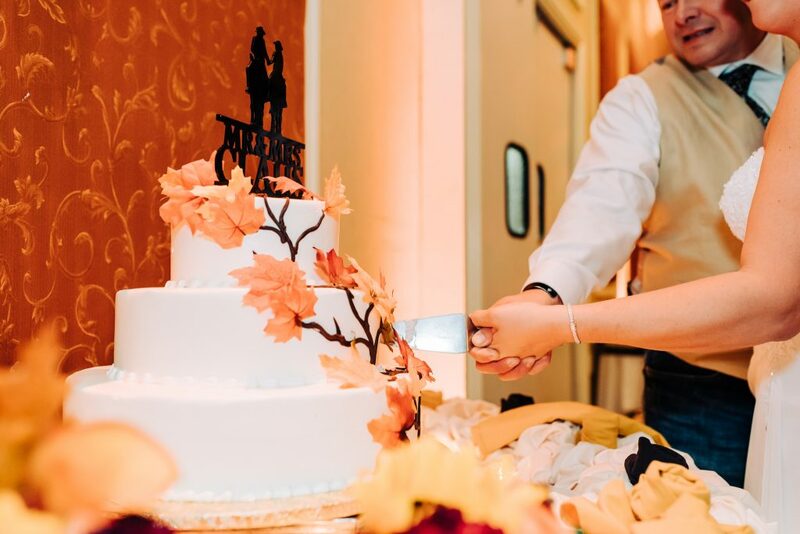 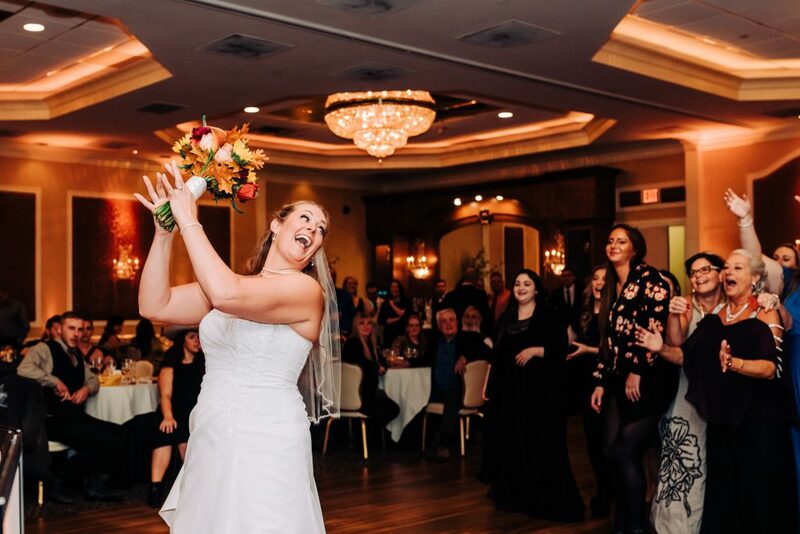 Below are some of our favorite moments from their gorgeous Poughkeepsie Grand Hotel wedding.